Vieux Lyon on the map. 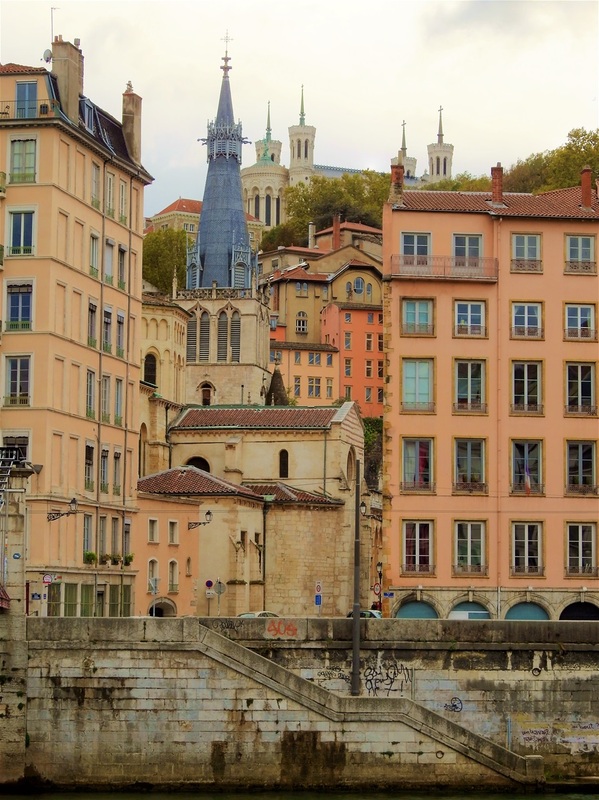 The extensive Renaissance neighborhood of Vieux Lyon (Old Lyon) is built at a strip of flat land between the foot of the Fourvière hill and the Saone River. 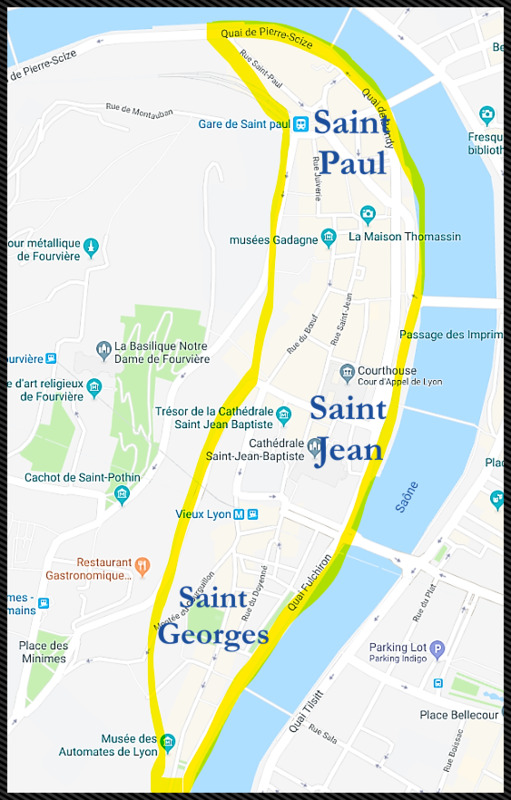 Vieux Lyon can be divided into three distinct quarters: Saint Jean, Saint Paul and Saint Georges. 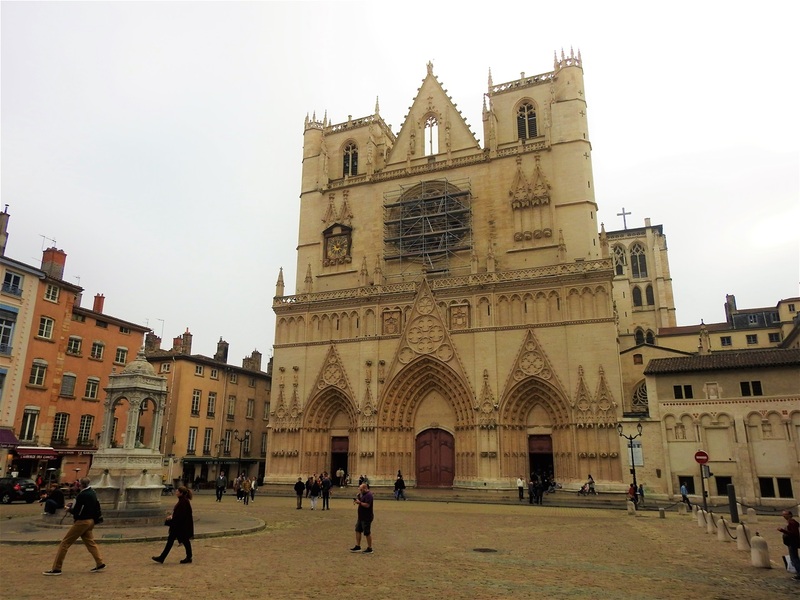 The Saint Jean quarter is the central section dominated by the gothic Cathedral of St Jean, seat of the Primate of Gaul, a title still conferred upon the archbishop of Lyon. This area was home to the high clergy and the aristocracy and thus the focus of political and religious power in the Middle Ages. 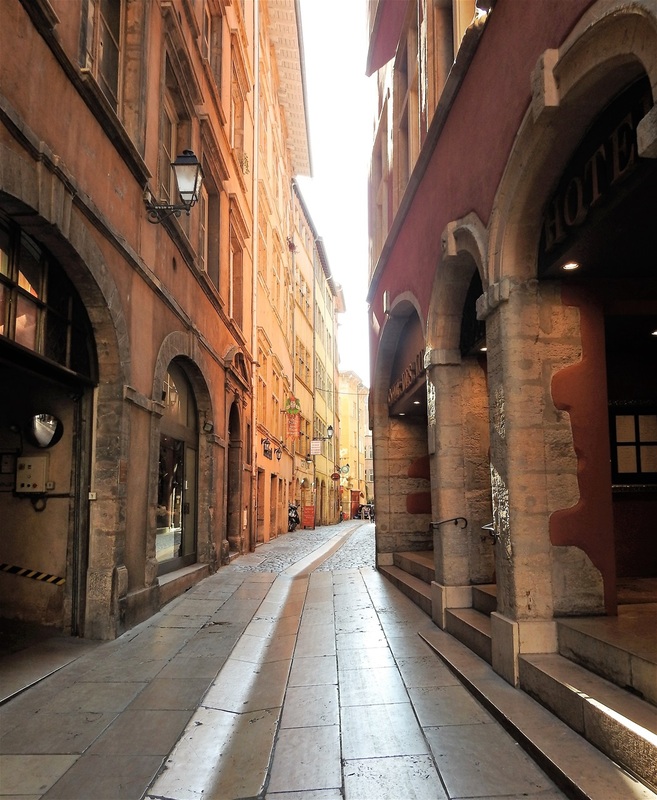 Saint Paul quarter was the home to the bourgeoisie, the trade and financial centre of Renaissance Lyon. In the 15th and 16th centuries, predominately Italian banker-merchants moved into sumptuous urban residences (called hôtels particuliers) of the Saint Paul quarter. The Saint Paul church, with its Romanesque lantern tower and its spectacular spire mark the quarter’s northern extremity. 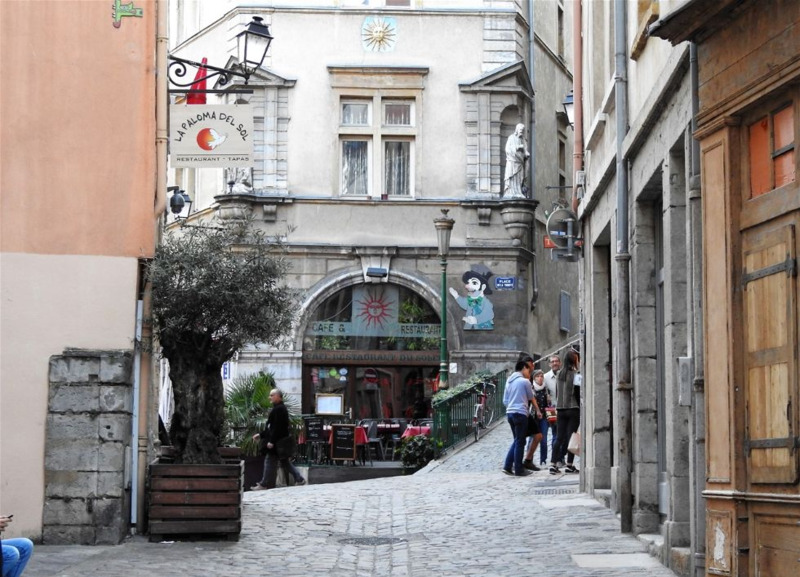 The Saint Georges quarter, home to the craftsmen, is where silk weavers settled here in the 16th century, before moving to the Croix Rousse hill in the 19th century. The Saint George's neo-Gothic-style Church on the banks of the Saône, was rebuilt in 1844 by the architect Pierre Bossan. The city of Lyon coat of arms outside a public building. 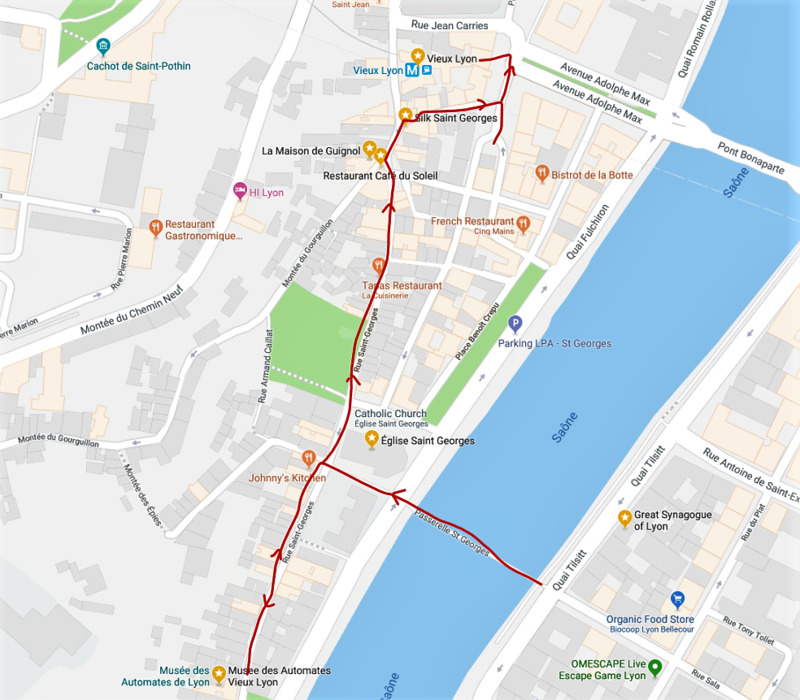 The layout of Vieux Lyon is such that there are very few connecting streets running perpendicular to the river. 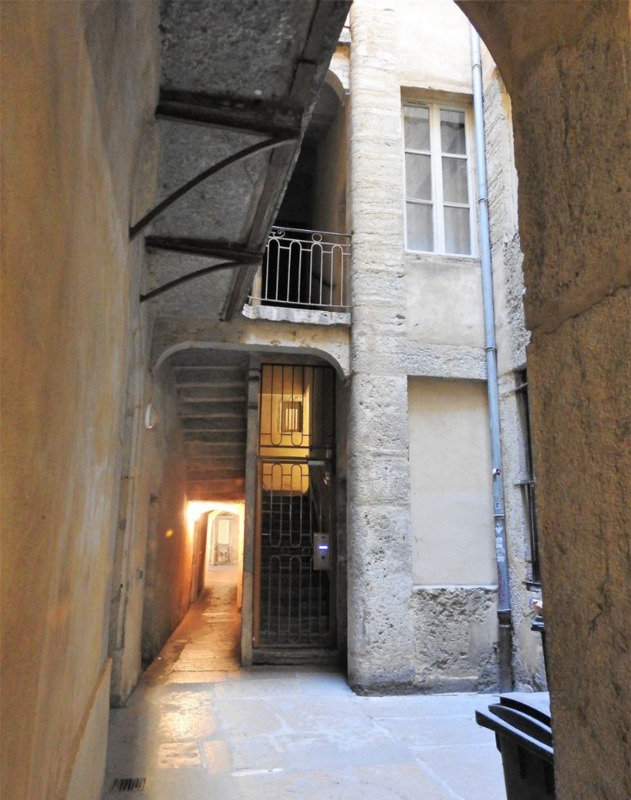 In the Middle Ages, were built corridors, passages and stairs through buildings and their courtyards to connect the very few parallel streets between the hill and the Saône. 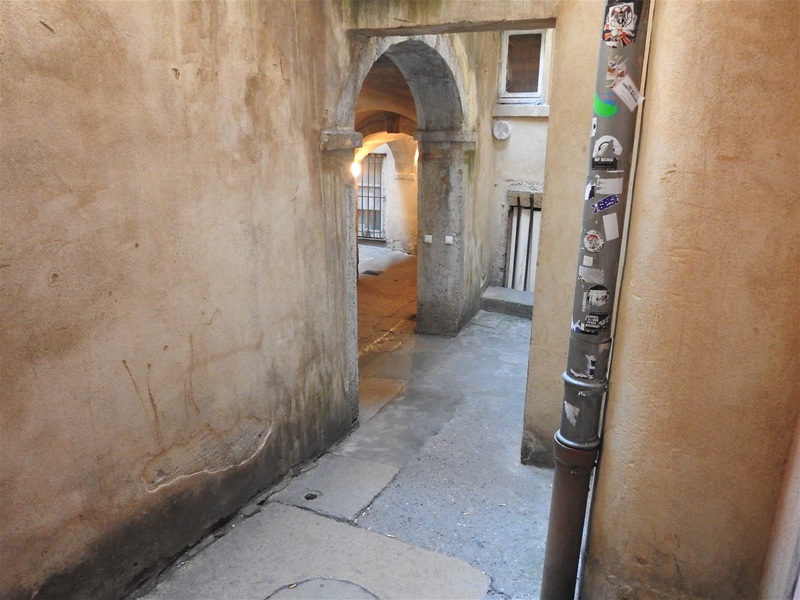 These corridors, called traboules (derived from the Latin trans-ambulare, meaning to pass through), allowed workmen and craftsmen to transport clothes and other textiles through the city while remaining sheltered from inclement weather. 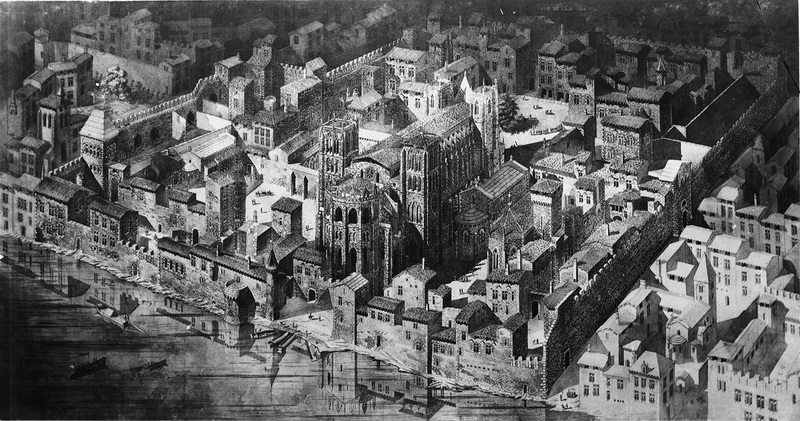 The first examples of traboules are thought to have been built in Lyon in the fourth century. Lacking water, the inhabitants moved to the banks of the Saône. The traboules thus allowed them to get from their homes to the river quickly and allowed the canuts (silk workers) on the La Croix-Rousse hill to get quickly from their workshops to the textile merchants at the foot of the hill. 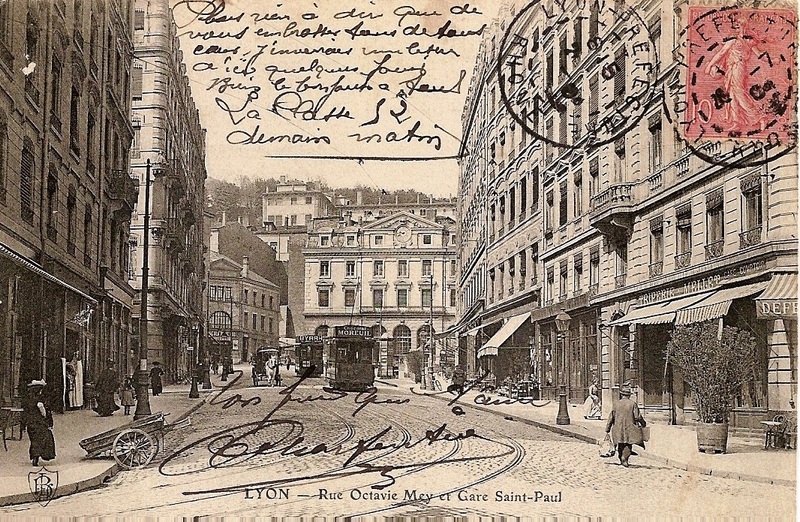 The traboules of Lyon are often credited with helping prevent the occupying Germans from taking complete control of these areas during World War II. According to René Goscinny and Albert Uderzo in “Le Tour de Gaule d'Astérix” (“Asterix and the Banquet”, as it known in English) traboules did the same with the occupying Romans! 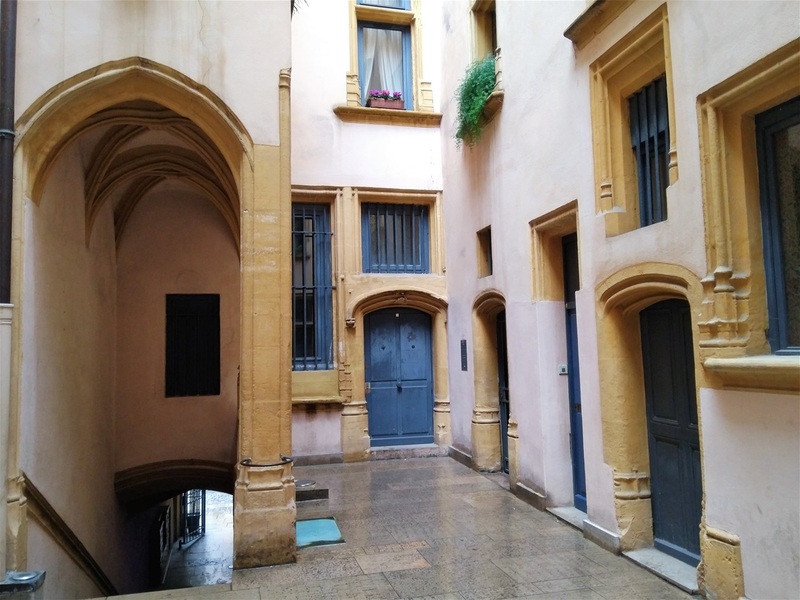 Courtyard of a traboule (Vieux Lyon). 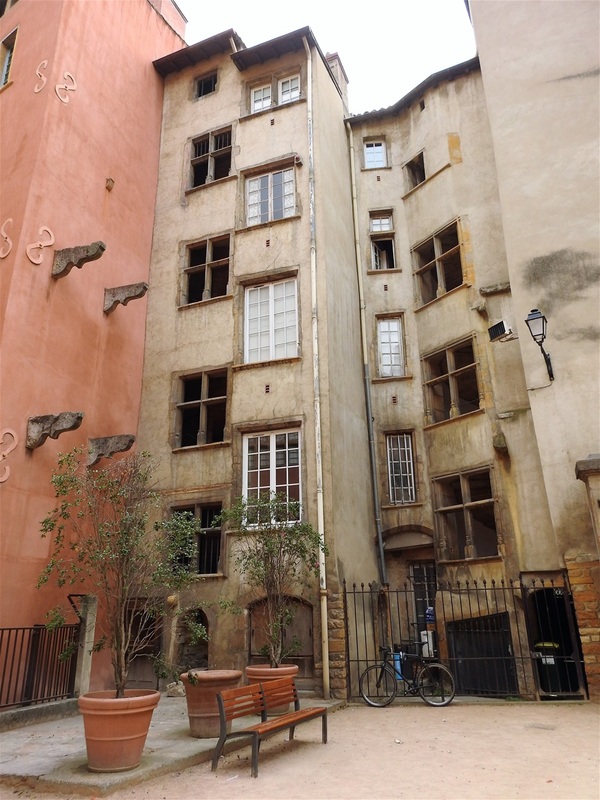 Part of the Long Traboule in Vieux Lyon. The "Traboule de la cour des Voraces" ("Traboule of the Voracious Court"), the most famous traboule, is located in the Croix-Rousse neighborhood. 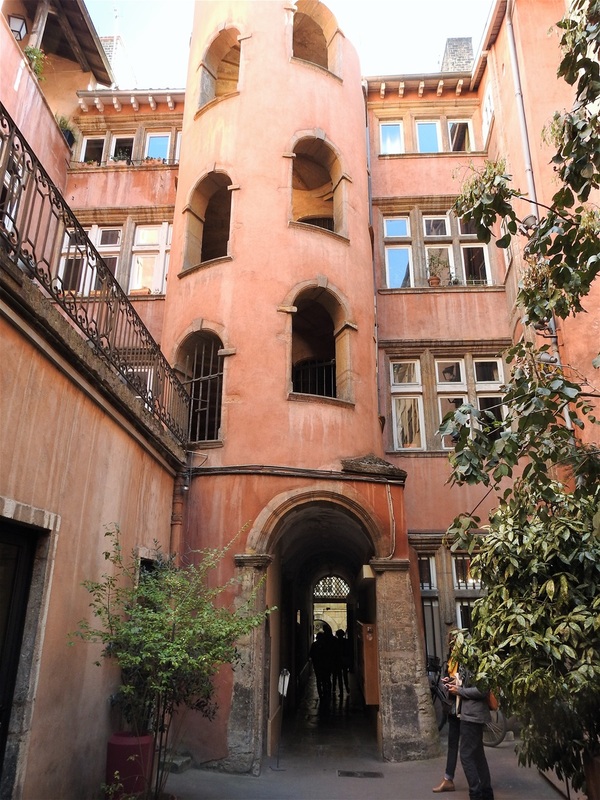 It is one of the landmarks of the “Canut Revolts” (Canut is a local term for silk workers) and it is also the oldest reinforced concrete stairwell in Lyon. For many inhabitants, being a "true Lyonnais" requires being knowledgeable about the city's traboules. Nowadays, traboules are tourist attractions, and over forty are free and open to the public. Most traboules are on private property, serving as entrances to local apartments. Many, if not most, of the underground passages have been blocked off and are currently used as storage areas. The traboule entrances, accessible to the visitor, are marked with metal signs and a short description. Open these entrances to discover an architectural heritage of galleries and spiral staircases in these secret passageways, as unexpected as they are unique. A courtyard as part of a traboule. 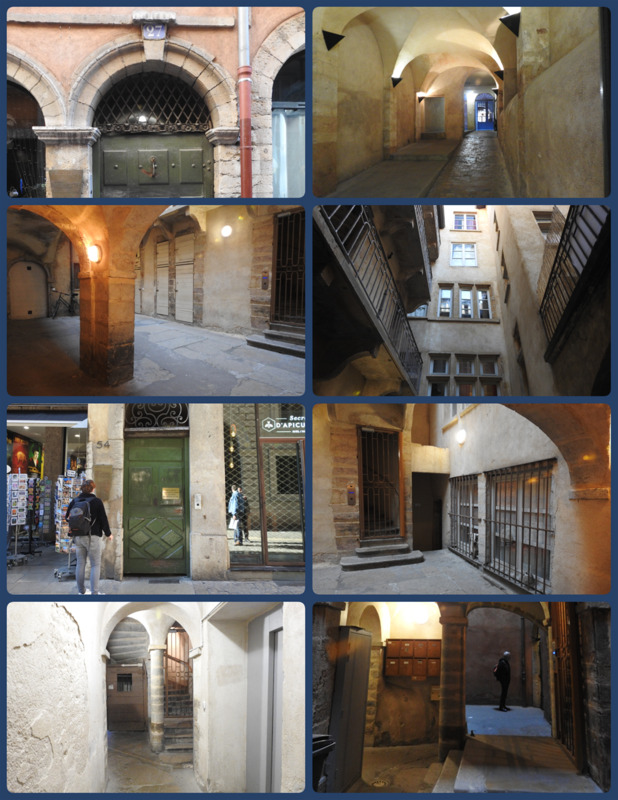 I will describe the walk in Vieux Lyon starting from the Saint Georges quarter. That was the best way for me, because I stayed in the Ainay quarter of the Presqu’île. I just had to cross the Passerelle St Georges to be on the other side. You will decide the point of strat depending on where you stay or you happen to be that day. After crossing the Passerelle St Georges, you are at the back of Église Saint-Georges. 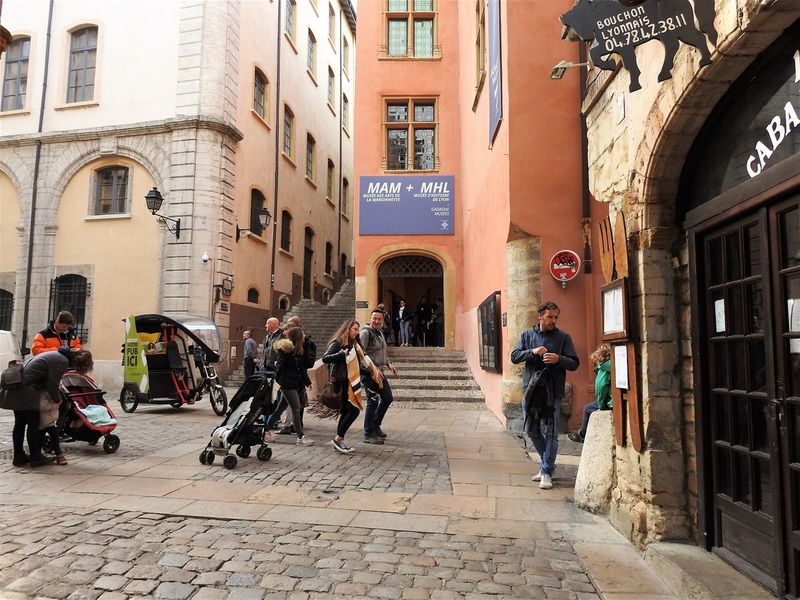 All the interesting places are located on the north of the church, but you may want to take a detour going southwards for some meters to visit Musée des Automates de Lyon. The museum opened in 1991, but its history started in 1946, when Augustine, Georges, and their son Robert established a workshop of construction of electro-mechanical automatons. 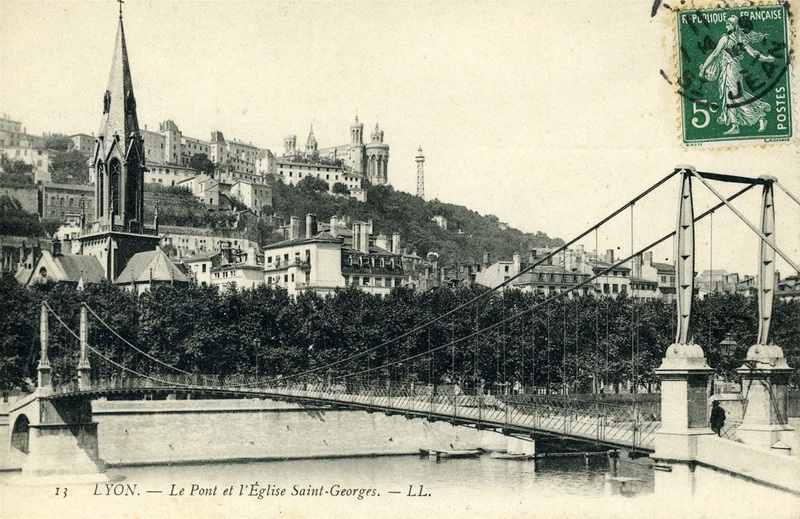 Passerelle St Georges, the church of Saint George (left) and the Fourvière hill (background). Musée des Automates de Lyon. These automatons were made to be sold or rent for the animation of shop-windows, for Christmas or other occasions. But as the years were passing by, the tradition vanished and the orders become scarce. Robert decided instead to open a permanent exhibition of his mechanical constructions. All the exhibits are made in the workshop and are handmade. A church existed here since the 6th century, which destroyed in the mid-8th century during a raid of the Saracens. It was restored in 802 by Leidrade, a scholar and man of the Church of the time of Charlemagne and dedicated to Saint George. In the 14th century, it remained a parish church, but was used by the Sovereign Military Hospitaller Order of Saint John of Jerusalem (Order of Malta) and in 1315, the Commandery was located just next. In 1793, it became a hay barn, as all churches in Lyon closed. The Commandery destroyed after a fire and in 1884 and a school was built in its place. The current neo-gothic church was completed in 1848, after plans by the architect Pierre Bossan (who also made the furniture, later deemed his work on this church as a "youthful mistake"), who also made the plans for the basilica of Fourvière. Abandoned between the late 1970s and 1989, the church was later assigned to the Priestly Fraternity of St. Peter under the Motu proprio Ecclesia Dei, which granted the practice of liturgical books in Latin. The church named after Saint George of Lod (born in Lod, in today Israel), a Roman soldier of Greek origin and a member of the Praetorian Guard for Roman emperor Diocletian, who was sentenced to death for refusing to recant his Christian faith. He became one of the most venerated saints and megalo-martyrs in Christianity, and was especially venerated by the Crusaders. In hagiography, as one of the Fourteen Holy Helpers and one of the most prominent military saints, he is immortalized in the legend of Saint George and the Dragon (representing the victory of Christianity over Satan). England, Georgia and several other nation states, cities, universities, professions and organisations all claim Saint George as their patron. Passerelle St Georges & Église Saint-Georges. Carpaccio’s St. George and the Dragon (1502). Rue Saint-Georges is a very beautiful street full of shops and restaurants. It passes in front of the church Saint Georges and continues north. It meets Montée du Gourguillon and they unite to form Rue Tramassac. Montée du Gourguillon is a street that goes uphill to the roman archeological site on the Gourguillon Hill. La Place de la Trinité is formed where the three streets meet. Fresco on a wall at Place de la Trinité. Café du Soleil at Place de la Trinité. 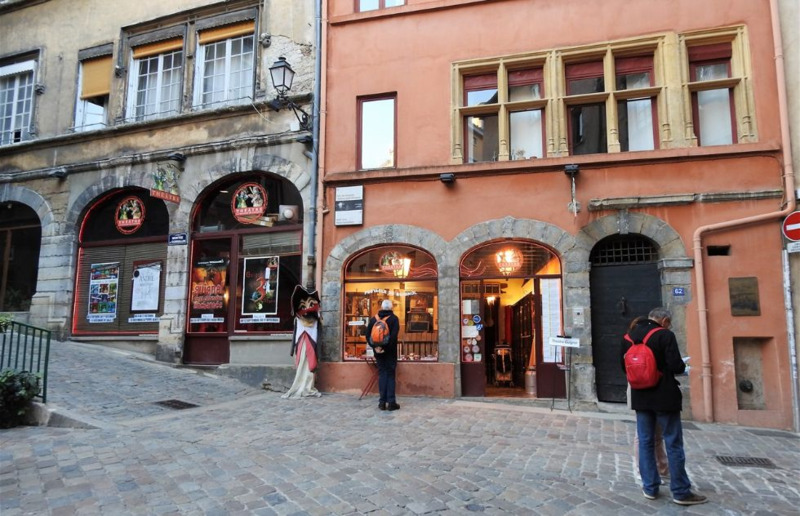 At the junction of the two roads, a wedge is formed, which is occupied by Café du Soleil (housed in "maison du soleil" built in 1723), one of the most famous and among the oldest bouchon Lyonnais in the old city. Café du Soleil with its unique decoration and its corner terrace that opens on the House of Guignol and the Montée du Gourguillon, serves some of the best traditional local cuisine. Across Montée du Gourguillon stands the Théâtre La Maison de Guignol (House of Guignol House). 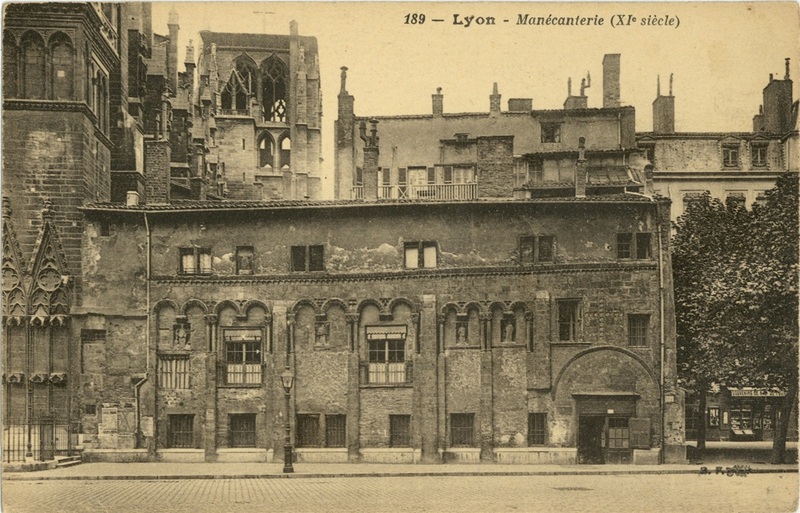 In 1962, at the time of the modernization and reconstruction of the city of Lyon, the Grand Théâtre de Guignol of the Quai St Antoine, was destroyed. It was located on the site of the current Théâtre des Ateliers. Théâtre La Maison de Guignol. A group of impassioned about Guignol “gônes”, led by Mr. Charnoux, created the Maison de Guignol Theater in 1965, in tribute to the Grand Théâtre. Thus, in this smaller theater, there is a walkway in the form of an Italian-style balcony, as well as other references to the splendor of the Quays St Antoine. The word “Maison” (house) of the title of the theater comes from the location of the Theater, on Place de la Trinité. In the plays of the "classical repertory" and in particular in the play "Le Déménagement" ("The Relocation"), considered as the first work of Laurent Mourguet, the character of Guignol lives here at 1, Montée du Gourguillon. The Place de la Trinité, with Café du Soleil in the middle is the basic décor of the plays. The Place de la Trinité, with Café du Soleil in the middle is the basic décor of the Guignol plays. The word “gône” in the dialect Lyonnais means kid or child. It is a synonym to the French words enfant, gamin and gosse, and it derives of the greek word “γόνος” (go’nos), which means offspring or progeny. One of my souvenirs I got from Lyon was a T-shirt with a Lion, the symbol of the city of Lyon, and the inscription “Lyon, capitale des gônes”. 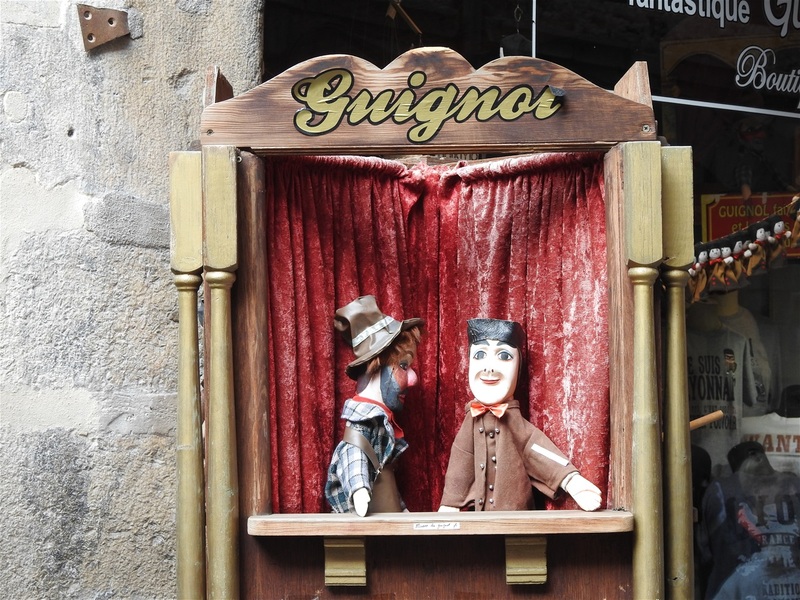 Guignol is the main character in a French puppet show which has come to bear his name. It created by the French puppeteer Laurent Mourguet and represents the workers in the silk industry of Lyon (les canuts). 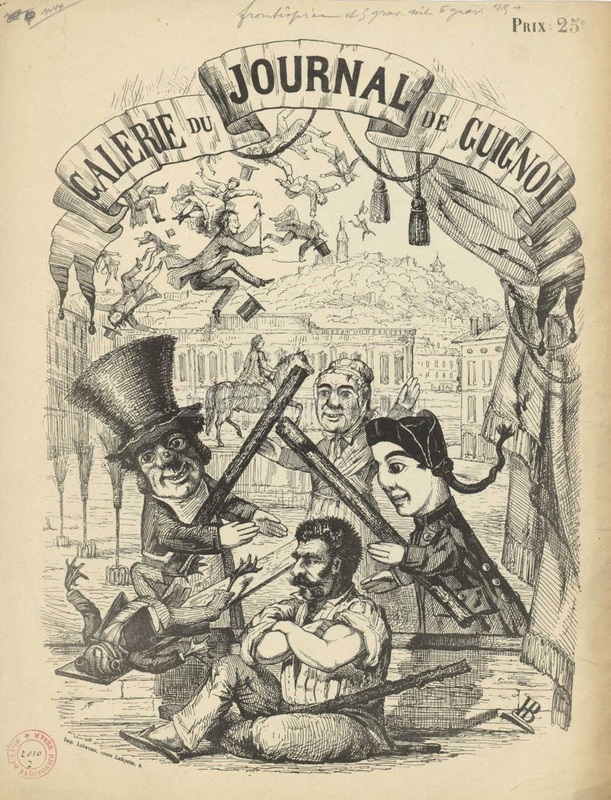 Although often thought of as children's entertainment, Guignol's sharp wit and linguistic verve have always been appreciated by adults as well, as shown by the motto of a prominent Lyon troupe: "Guignol amuses children… and witty adults". Laurent Mourguet, the creator of Guignol. 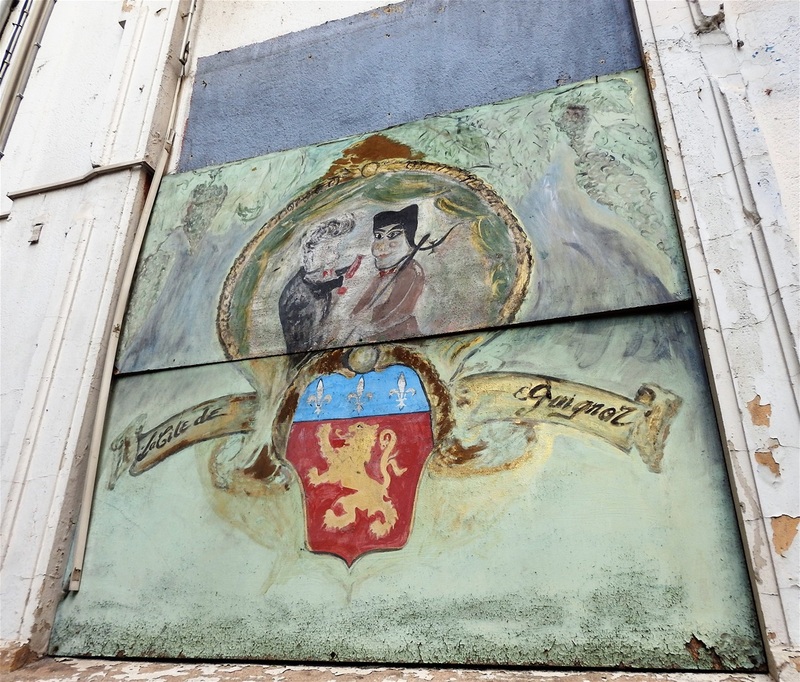 A Guignol fresco in Lyon. Laurent Mourguet, was born into a family of modest silk weavers in 1769. The certificate of his marriage to Jeanne Esterle in 1788 shows he was unable to read. When hard times fell on the silk trade during the French Revolution, he became a peddler, and in 1797 started to practice dentistry, which in those days was simply the pulling of teeth. The service was free; the money was made from the medicines sold afterward to ease the pain. To attract patients, he started setting up a puppet show in front of his dentist's chair. In the end, his strategy worked very well to his advantage. His first shows featured Polichinelle, a character borrowed from the Italian “commedia dell' arte” who in England would become Punch. By 1804 the success was such that he gave up dentistry altogether and became a professional puppeteer, creating his own scenarios drawing on the concerns of his working-class audience and improvising references to the news of the day. 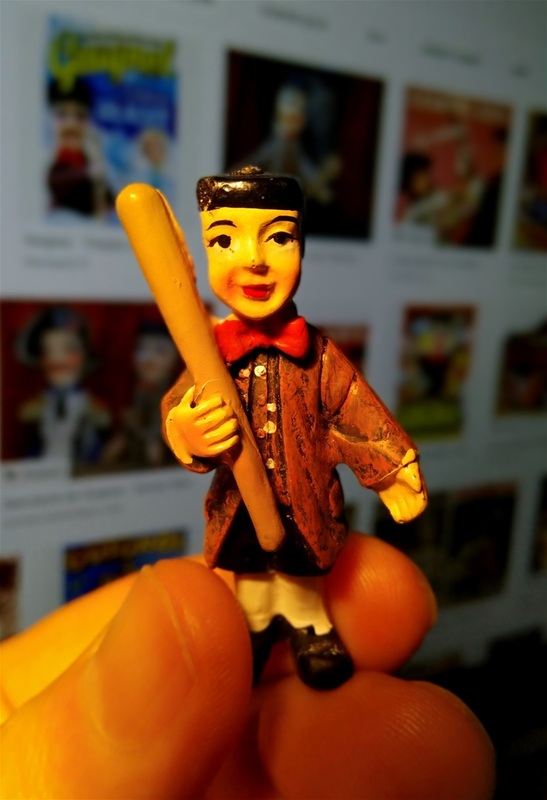 Little Guignol in my fingers! He developed characters closer to the daily lives of his Lyon audience, first Gnafron, a wine-loving cobbler, and in 1808 Guignol. Other characters, including Guignol's wife Madelon and the gendarme Flageolet soon followed, but these are never much more than foils for the two heroes. Although nominally a silkweaver like much of his original audience, Guignol's profession changes, as does his marital status; he can be in turn valet, peddler, carpenter, shoemaker, or unemployed; at times he is Madelon's husband, at times her smitten suitor according to requirements of the scenario. What remain constant are his poverty, but more importantly his good humor and his sense of justice. 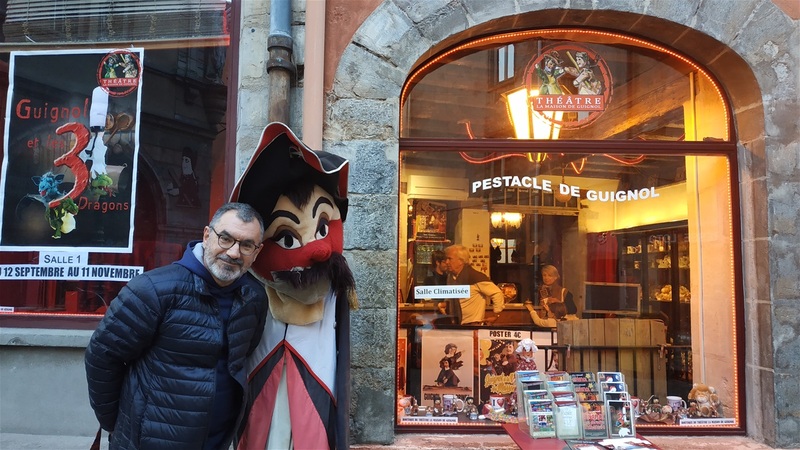 The use in French of "guignol" as an insult meaning "buffoon" is a curious misnomer, as Guignol is clever, courageous and generous; his inevitable victory is always the triumph of good over evil. Sixteen of Mourguet's children and grandchildren continued his tradition, and many of the companies performing today can trace their artistic heritage back to him although Laurent Morguet´s last descendant - Jean-Guy Morguet - died October 8, 2012, at the age of 82, after working all his life in the Theatre de Guignol at Lyon. Jean-Guy, learnt his job helping his grandmother Augustine and then his parents. He became, later, the director of the whole theatre until his death. 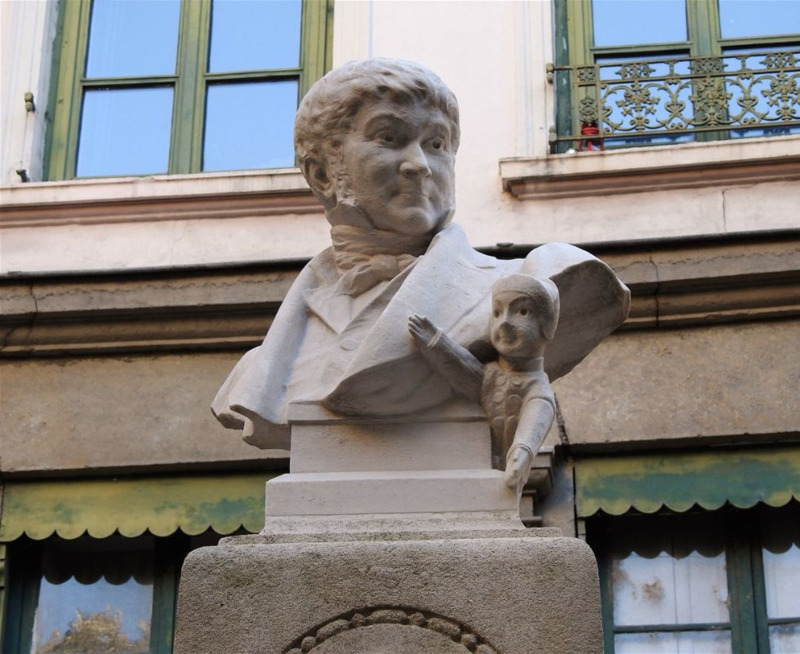 Guignol's original caustic satire has often been watered down to simple children's fare, and has even been used to parody grand opera, but his original spirit still survives in his hometown of Lyon, where both traditional and original contemporary performances are an integral part of local culture. In addition to his social satire, Guignol has become an important protector of the local dialect, the “parler lyonnais”. Galerie du Journal de Guignol ; Représentation de Gnafron, Guignol et Madelon à Lyon. End of 19th century. Some meters to the north, at the corner of Rue Tramassac and Rue Mourguet, stands the Soierie Saint Georges (Saint Georges Silk Workshop), a 19th century weaving workshop and its silk shop. 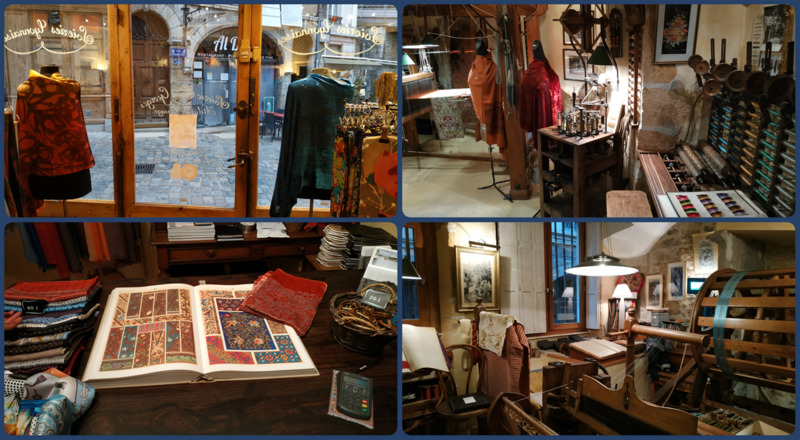 The place presents a brief overview of the history of silk in Lyon and offers you an insight of the silk weaving technique through hand weaving machines still in operation. Soierie Saint Georges at the corner of Rue Tramassac and Rue Mourguet. The shop is small and very pleasant, a good place to buy a silk scarf or tie. Rue Mourguet and the entrance to the funicular/metro station. 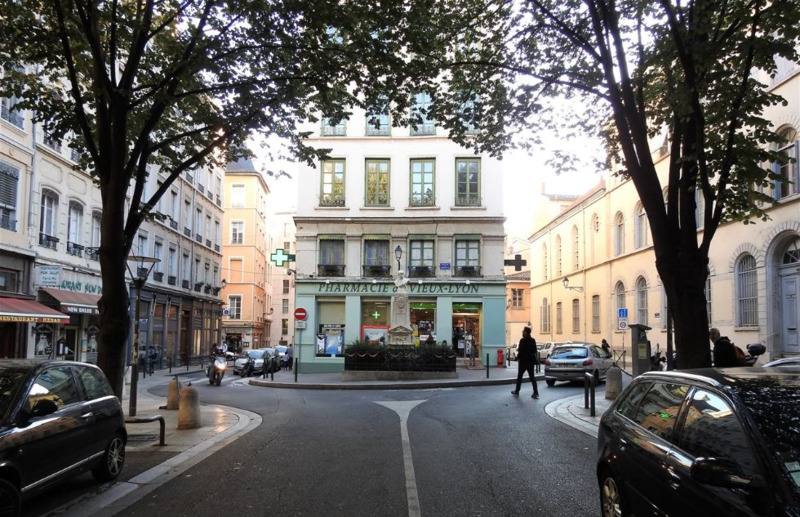 Turn in Rue Mourguet and then right on Avenue du Doyenné to admire an old pharmacy in front of which there is a monument of the creator of Guignol, Laurent Mourguet. 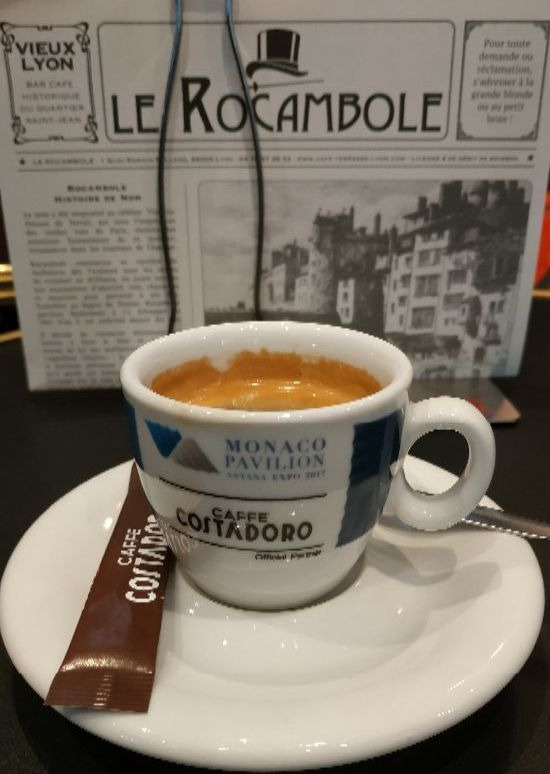 Take a U-turn and after passing in front of the funicular/metro station have a coffee and a cake at Café de La Ficelle. Here you can rest a bit before continuing your walk into Saint-Jean Quarter. Avenue du Doyenné. The old pharmacy and the monument of the creator of Guignol, Laurent Mourguet. 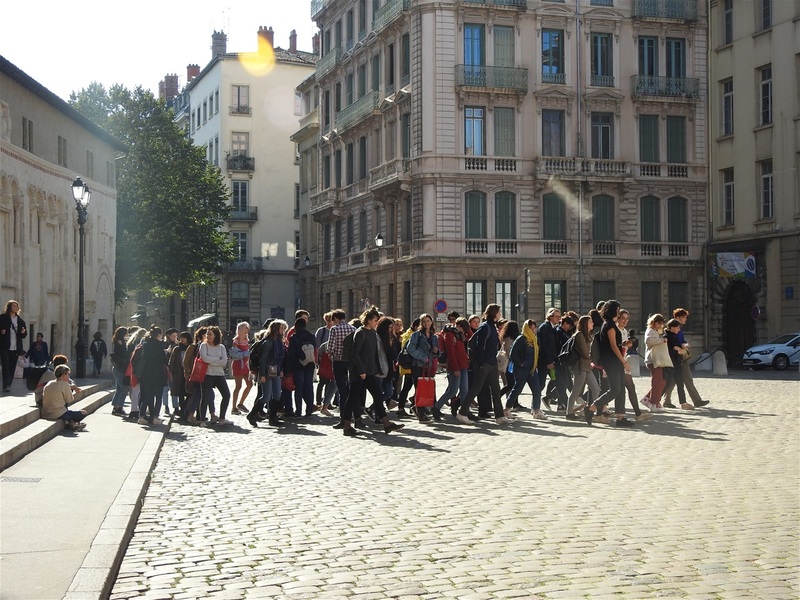 Saint-Jean Quarter is the central part of Vieux Lyon and the most crowded. 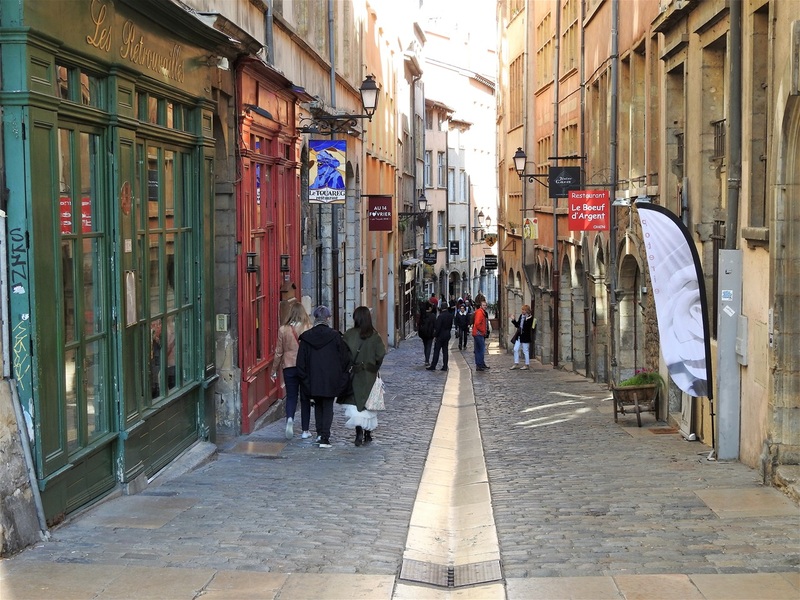 The main street of the area, Rue Saint Jean, is a pedestrian only artery with lots of restaurants, cafés and souvenir shops and thus it is always full of tourists. Rue du Boeuf is the other basic street of the area, less crowded and a much better place to walk and enjoy the renaissance architecture of the city, without having to bump into other people all the time. But, it is the Cathédrale Saint-Jean-Baptiste, which gives to the area its unique importance and mystical ambience. The beginning of Rue Sain Jean at Place Saint-Jean. Coming from the south and entering into Place Saint-Jean, there is no way not to be astonished by the beauty of this square. 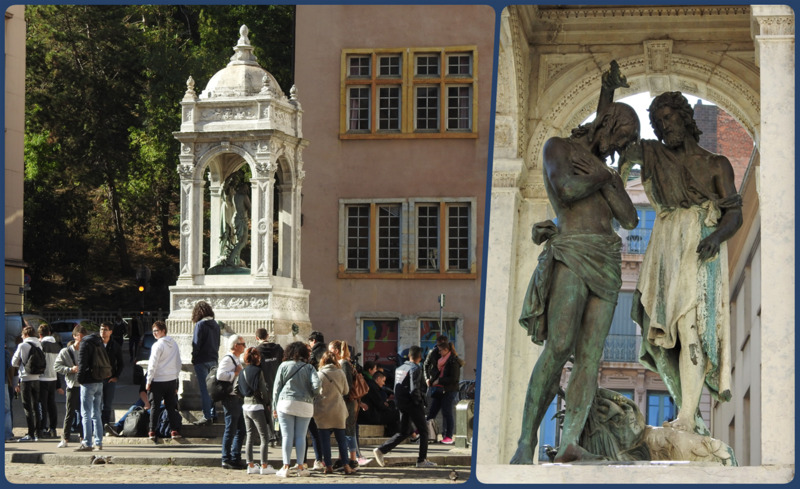 In the middle of the open space stands since 1844 a fountain designed by the Lyonnais architect René Dardel. It reproduces a small ancient temple in a neo-renaissance style housing a sculpture of Saint John the Baptist christening Christ, made by Jean-Marie Bonnassieux. The fountain in the middle of Place Saint Jean, featuring a sculpture of Saint John the Baptist . The cafes and restaurants at the northern site of Place Saint Jean (the beginning of Rue Saint Jean). 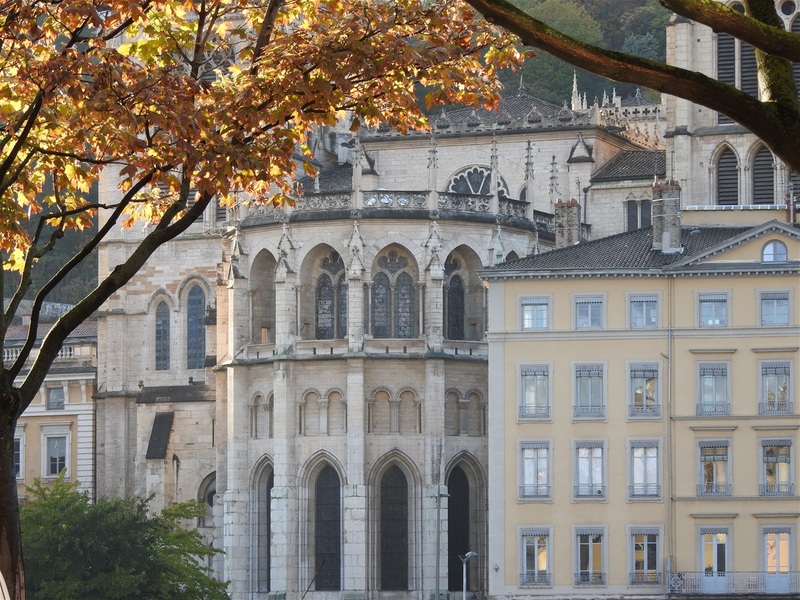 On the eastern side of the square stands the impressive recently restored and cleaned façade of the Cathédrale Saint-Jean-Baptiste, the Lyon Cathedral. 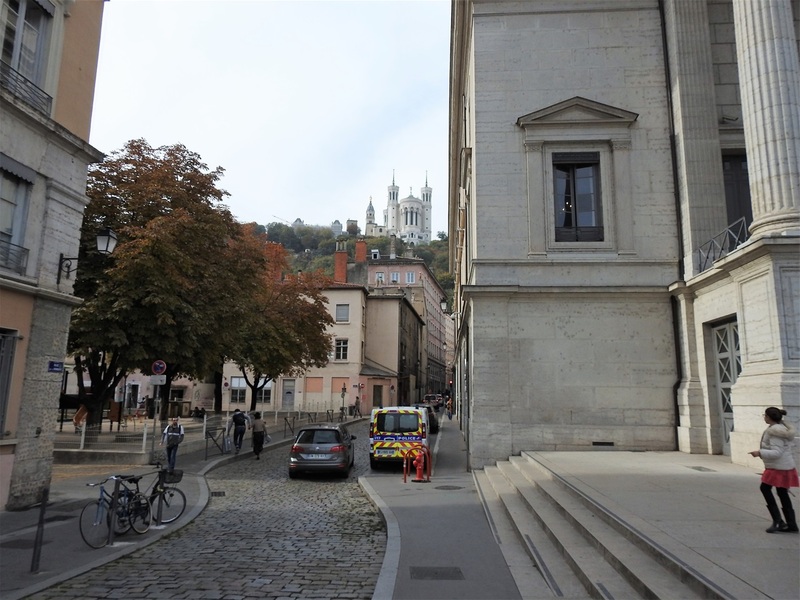 But the most spectacular characteristic, according to my opinion, of the square is the view one has over Fourvière Hill and the Basilique Notre Dame de Fourvière. 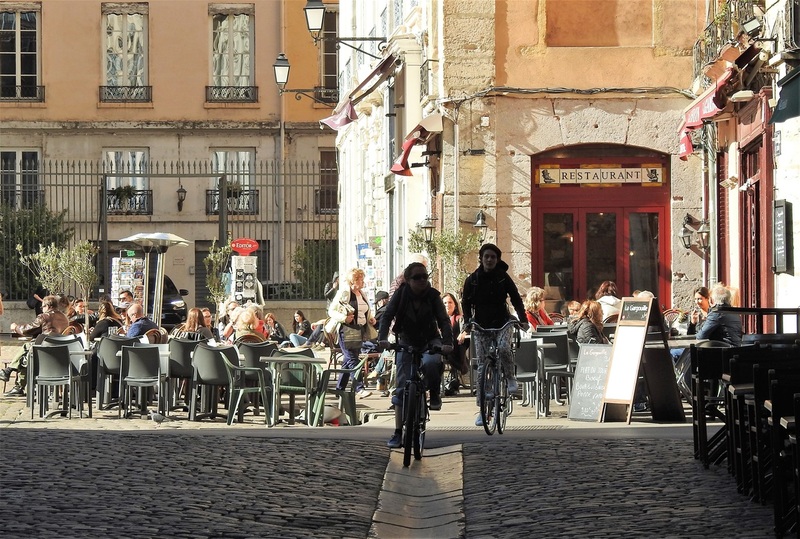 On the northern side of the square, where Rue Saint Jean starts, there are several cafes and bars for you to relax or have a bite. The square took its current appearance in the 1850s, when Rue de la Brèche which connects the square to Tramassac Street, was widened. There were plans for further enlargement of the square by turning down the buildings to the eastern side. The square would then have taken the form of a large regular rectangle bounded on the north by rue Tramassac. 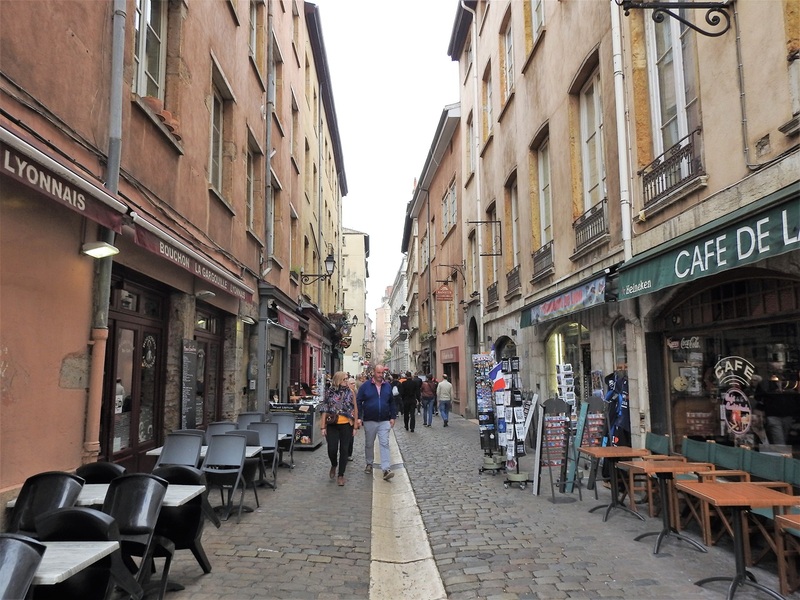 The rue des Antonins was also to be enlarged. This part of the project has never been realized, so the area kept much of its renaissance appearance. People in Place Saint Jean. Cathedral Saint-Jean seen from across Saone River. The construction of the Cathédrale Saint-Jean-Baptiste begun in 1180, on the ruins of a much older church, and completed in 1476. The apse and choir are of Romanesque design, while the nave and façade are Gothic. 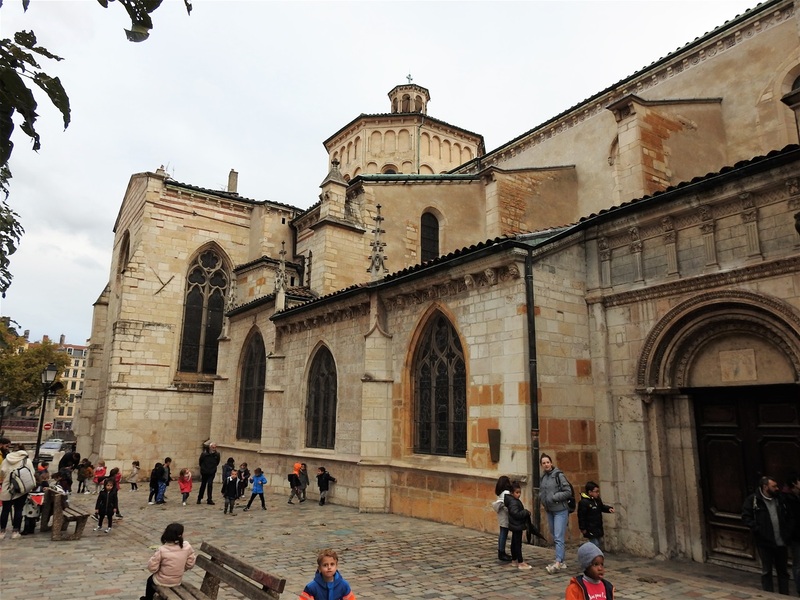 The cathedral is also known as a "Primatiale" because in 1079 the Pope granted to the archbishop of Lyon the title of “Primate of All the Gauls” with the legal supremacy over the principal archbishops of the kingdom. 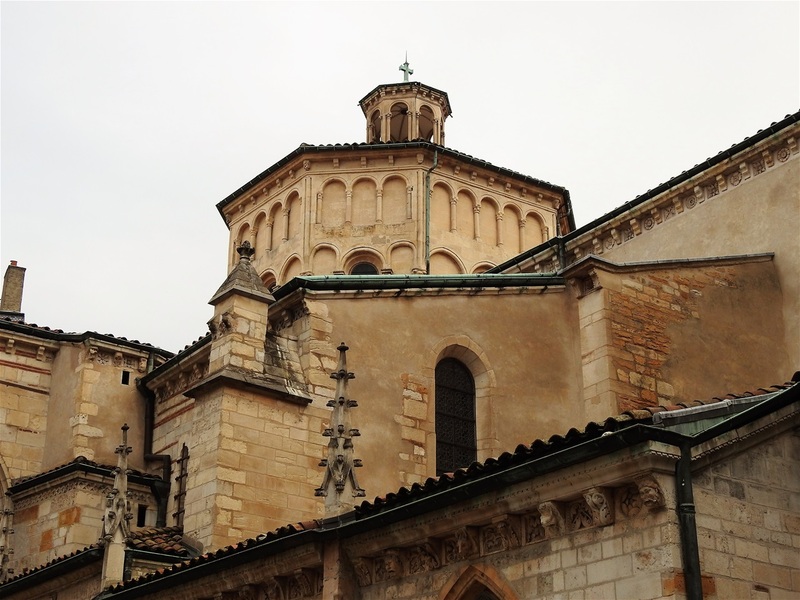 From 1165, under the episcopate of Guichard (1164-1181) begins the construction of an enclosure which defines the perimeter of the "Cloister Saint-Jean", enclosing in the north the churches Saint-Jean, Saint-Etienne and Sainte-Marie and Sainte-Croix; in the south the parish church of Saint-Romain, the choir, the auditorium, the prison, the residences of the canon, the archiepiscopal palace. Cloister Saint-Jean in the 12th century. The Lyon Astronomical Clock of Saint-Jean Cathedral. Noteworthy are the two crosses to the right and left of the altar, preserved since the Second Council of Lyon of 1274 as a symbol of the union of the churches, and the Bourbon chapel, built by the Cardinal de Bourbon and his brother Pierre de Bourbon, son-in-law of Louis XI, a masterpiece of 15th century sculpture. The Lyon Astronomical Clock, a 9-meter tall mechanical clock, is installed in the cathedral. An astrolabe indicates the date and position of the moon, sun, and earth, as well as the stars. 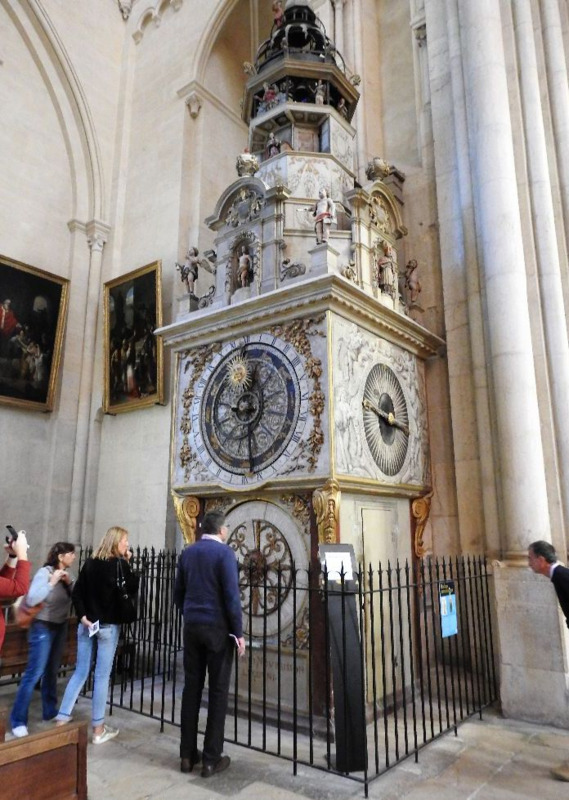 The first documentary evidence of an astronomical clock in the cathedral is from 1383. The clock is currently inactive and has been such since 2013. A notice on the clock says the clock will be repaired along with other planned repairs on the church interior. Indeed, the cathedral interior is under major restorations, so most of it is covered and not possible to be seen. The cathedral has gone thru restorations and renovations throughout all of its existence. An episode, though, of the recent restorations in the 2000s and 2010s is of an intriguing interest. 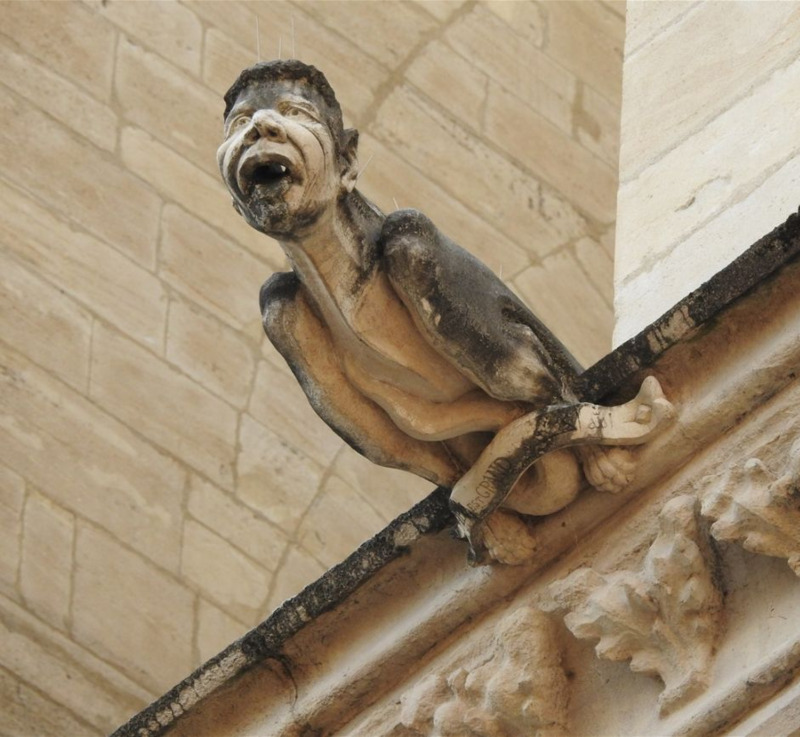 In 2010, stonemason Emmanuel Fourchet realized a gargoyle located a dozen meters high on the northern part of the cathedral (on Rue Saint-Etienne), which is much talked about. Indeed, he made the decision to carve this element to resemble to the head of the construction team, Ahmed Benzizine. The Ahmad-like gargoyle is adorned with the double inscription “Dieu est grand” (God is great) and « الله أَكْبَر » (Allahu akbar). Ahmed Benzizine-like gargoyle is adorned with the double inscription “Dieu est grand” and « الله أَكْبَر » (Allahu akbar). 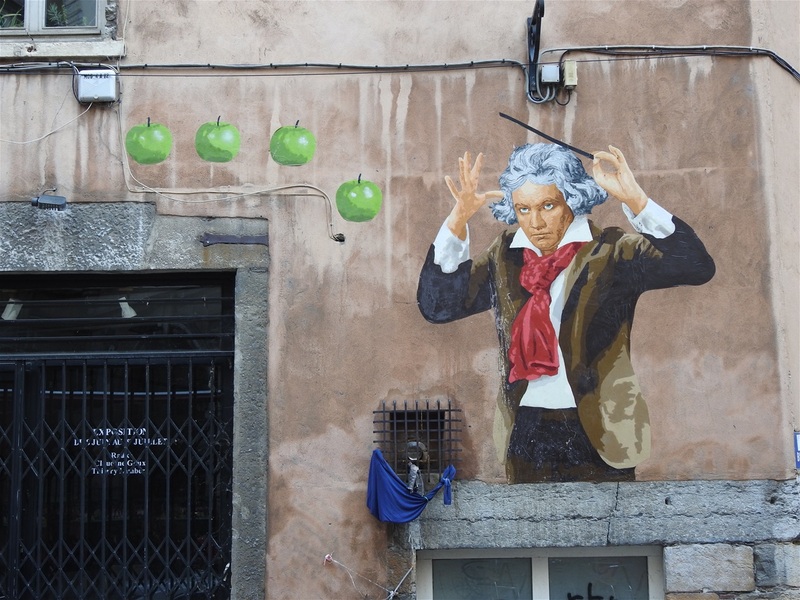 This act raised a big controversy, as some people believe that "Muslims are taking over the churches with the help of the Catholic authorities". On the contrary, Imam Kamel Kabtane, rector of the Grand Mosque of Lyon sees only "an example of the Christian-Islamic friendship in Lyon" and recalls that "in 1875, at the consecration of Our Lady of Fourvière, the Emir Abd el-Kader was officially invited ". Father Vincent Feroldi, episcopal delegate for relations with Muslims for the diocese of Lyon, recalls that the presence of Arabic inscriptions on French churches is a proven tradition, as evidenced, for example, on one of the doors of the cathedral of Puy (in the town of Le Puy-en-Velay). In any case, do not forget to take a picture of the “peculiar” gargoyle. 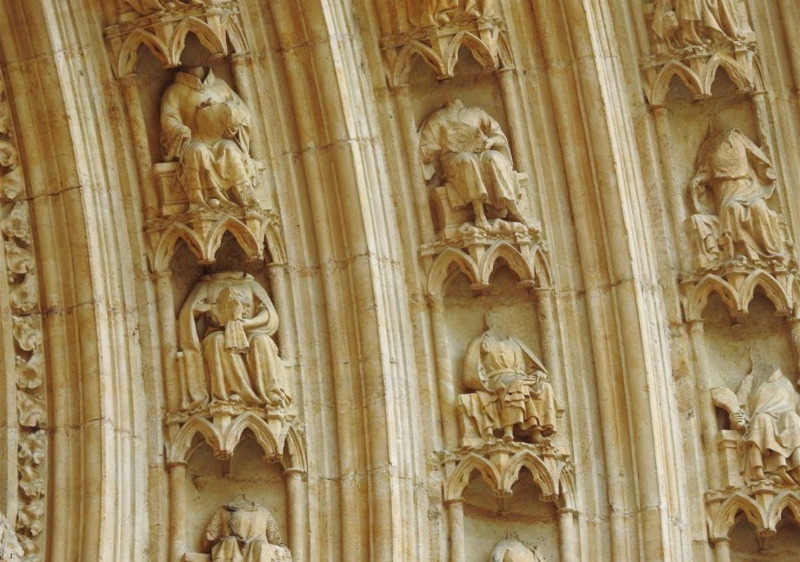 Another feature of the Cathedral that raises questions is that all statues in the alcoves of the facade are destroyed and all angels in the three portals are decapitated. This is also the case in many other churches in the area. In 1562, the cathedral, as well as other churches, was devastated by Calvinist troops headed by François de Beaumont, baron des Adrets during the French Wars of Religion. Decapitated figures in the facade of Saint-Jean Cathedral. It is estimated that three million people perished in this period from violence, famine, or disease in what is considered the second deadliest religious war in European history (surpassed only by the Thirty Years' War). 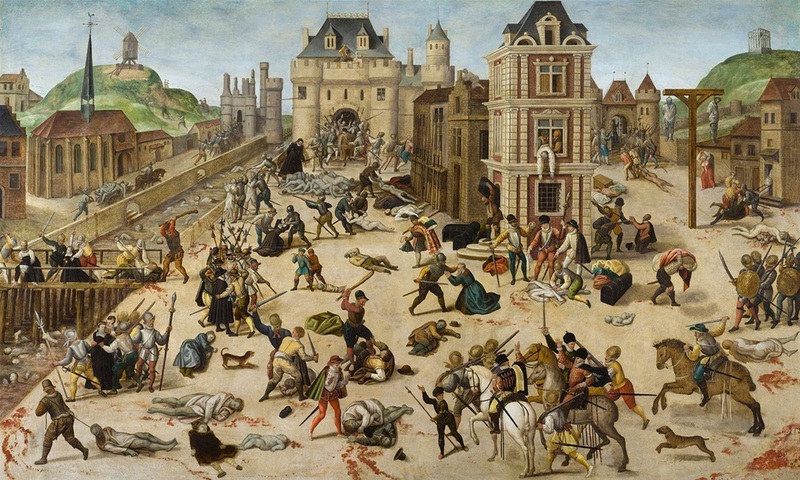 A prominent event of these Religious Wars is the infamous St. Bartholomew's Day massacre,that took place in Paris in the night of 23–24 August 1572 and lasted many days resulting in the killing of thousands of Huguenots. Depiction of the St. Bartholomew's Day massacre by François Dubois. Each December, Lyon holds an annual Festival of Lights. The tradition dates to 1643, when on December 8, the people of Lyon would place a lit candle in the window, a custom still maintained by many residents to this day. Jardin Archéologique is located at the northern side of Cathédrale Saint-Jean-Baptiste. During the Festival, a choreographed lighting display appears on the façade of the cathedral. After taking a picture of the Ahmad-like gargoyle, at Rue Saint-Etienne, at the back side of the cathedral you will see a small park (Jardin Archéologique), where the remnants of older churches (Saint-Ettiene and Sainte-Croix) are preserved. The Manécanterie (Parish choir school) is placed side by side to the south southwest of the cathedral and is a part of the former convent of the cathedral. This small Romanesque building served first as dining hall to the canons of Saint Jean, before becoming a parish choir school, namely a school for the singing of the clergy. The Manécanterie stands on th right of the Cathedral. Late 19th century photo. 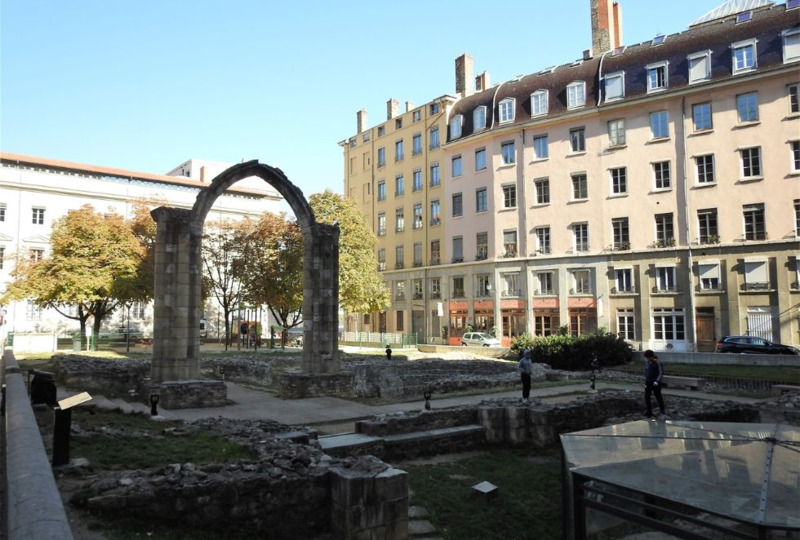 The Manécanterie is probably the oldest building of Lyon, with the exception of the Roman buildings. It was built in the 11th century, but it is based on constructions of the 2nd and 8th centuries. It was successively transformed throughout the late Middle Ages and the modern time. 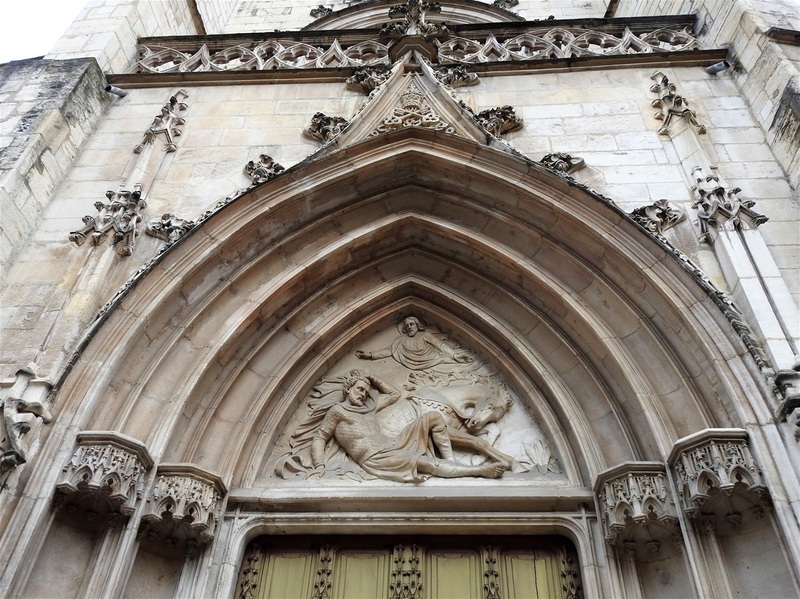 The sculptures of the saints underwent damages by the Protestants in 1562. From the 16th to the 18th century, the building had many architectural modifications, including the drilling of Gothic windows, the addition of a floor above the frieze, the transformation of the ground floor into shops, and the filling of certain arches. The current facade has a blind arcade overlaid with foliage, carried by small columns on pilasters. There are red bricks arranged in a geometrical way between the arcs and above. Since 1930 the place functions as a museum housing the Trésor de la Cathédrale de Saint-Jean, which is composed of liturgical objects such as old books, jewelry, clothing and tapestry. The entrance to the museum is located inside the cathedral. Rue Saint-Jean is like a tourist heaven: lots of bouchons and other restaurants, boulangeries, ice-cream shops, curios & memorabilia shops, patisseries and centuries old mansions and traboules! At the corner of Rue Saint-Jean and Rue Sainte-Croix stands the 1498, 3-storey Maison du Chamarier, also known as Hôtel d'Estaing (as the building was rebuilt in the 16th century by François d'Estaing.). From Latin cameriarus, the word "Chamarier" means the superintendent of the finances of the bishop of the Lyon Cathedral. The Marquise de Sévigné lived here when she was in Lyon. In the nineteenth century, the house was converted into apartments, but the residents had to leave the building in 1987 for extended renovations. Open the metal railings gate and get inside the small courtyard. The well and the fountain in the courtyard are attributed to Philibert de L'Orme. The courtyard of Maison du Chamarier. The Gothic styled spiral staircase has a large size and ornamentation. The entrance to the tower where the stairway is part, is surmounted by a canopy adorned with a pinnacle turret similar to those at the entries of Gothic churches. 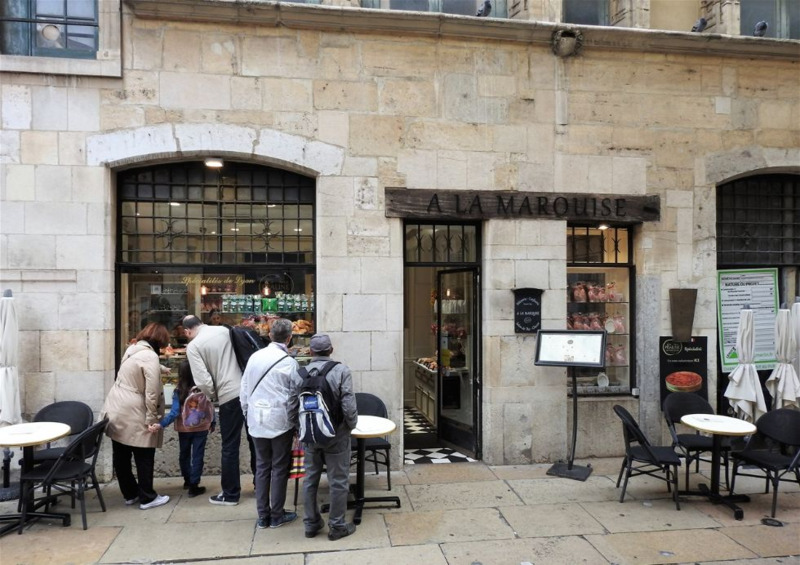 At the northern corner of the building (on Rue Saint-Jean) stands the patisserie “A La Marquise”, one of the most famous and old shops of that kind in Old Lyon. At “A La Marquise”, one can find all spécialités Lyonnaises: Tarte à la Praline, Brioches, Bugnes, Coussins, Quenelles etc. The shop has a very small room with tables inside, which is always crowded and also a couple of tables on the road. Diagonally from patisserie “A La Marquise”, stands a fine example of a Renaissance house, the Maison des Avocats. It is composed of several buildings around a courtyard. 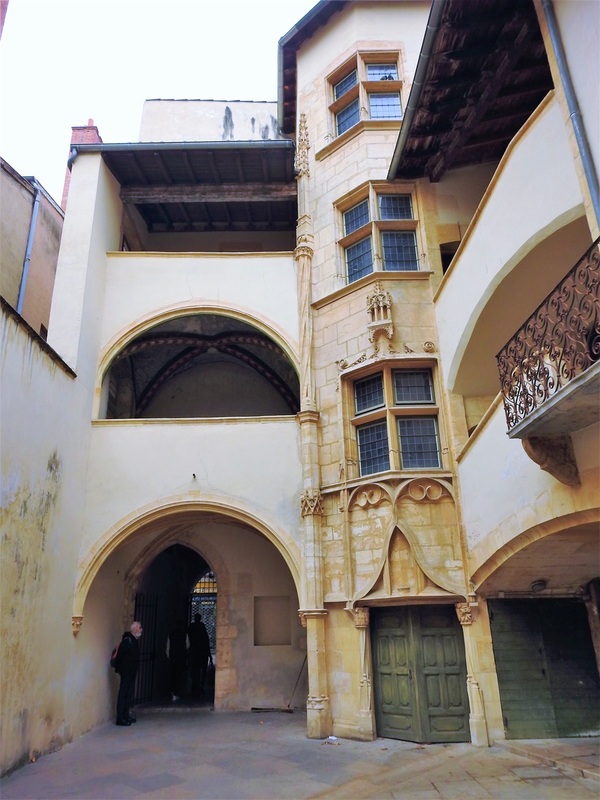 The oldest part of the complex is the eastern building (overlooking the Rue Saint-Jean) built in the first half of the 14th century for André Berchet and it is was named “Ostel de la Croys". It is frequented by the members of the brotherhood of La Basoche gathering former clerks of the prosecutor. In 1471 changes its name to "Auberge de la Croix d'Or", and by the end of the century it is enlarged by the acquirement a garden on Rue du Boeuf. Maison des Avocats. The building at the corner of Rue de la Bombarde and Rue Saint-Jean seen from Place de la Basoche. 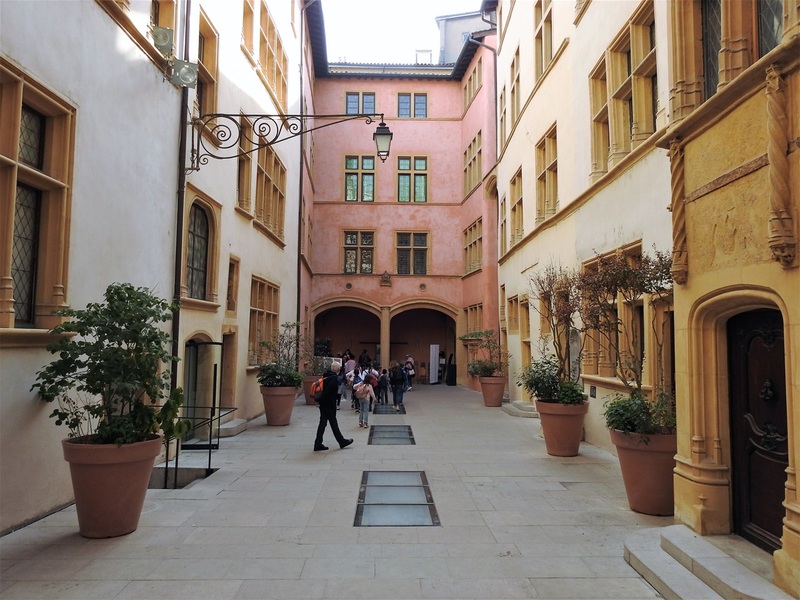 The courtyard of Maison des Avocats. Around 1516, the second main building is added in the courtyard. It is composed of three superimposed galleries, each composed of four Tuscan arcades resting on columns with flat capitals. It is this building seen from Rue de la Bombarde, which most impresses the visitor of today. The restored well in the courtyard also dates back to 1516. The house takes its final shape in 1528. It will be reunited and re-divided several times between the sixteenth and eighteenth centuries. Of the former 14th century house, only the wide carriage door that allowed the horse-drawn carriages to enter the courtyard remains. In the early years of the 19th century, the house transformed into a rental building: it is the beginning of a slow degradation. In 1968, the complex escapes a planned total demolition. 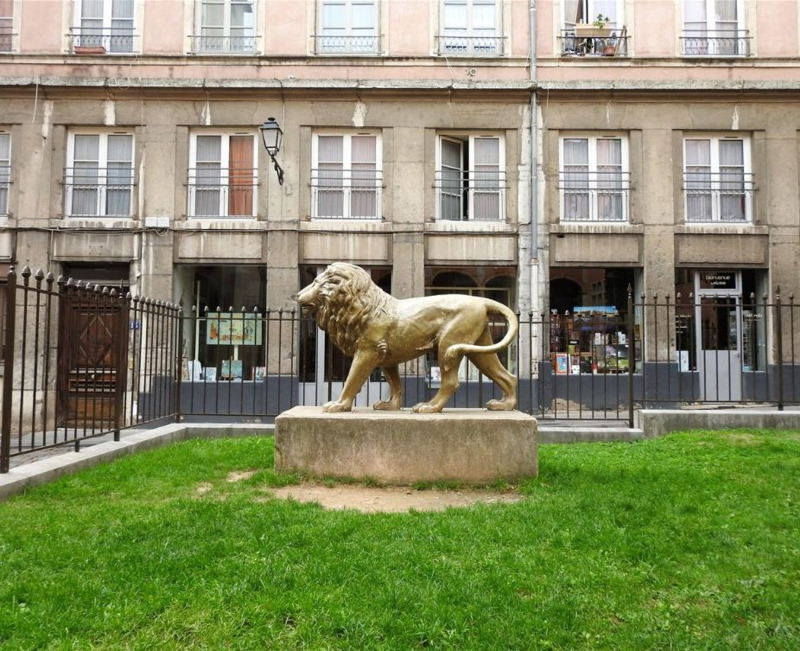 Eventually, only the two buildings on Rue de la Bombarde overlooking the courtyard demolished, clearing a space that occupies a little park, Place de la Basoche, in which a golden lion statue, symbol of the city, welcomes the visitors. The golden lion statue, symbol of the city, at Place de la Basoche. At the lobby of Musée Miniature et Cinéma. In 1979 started a thorough restoration of the complex, which finally sold in 2004 to be used as the Musée Miniature et Cinéma (inaugurated on February 10, 2005). 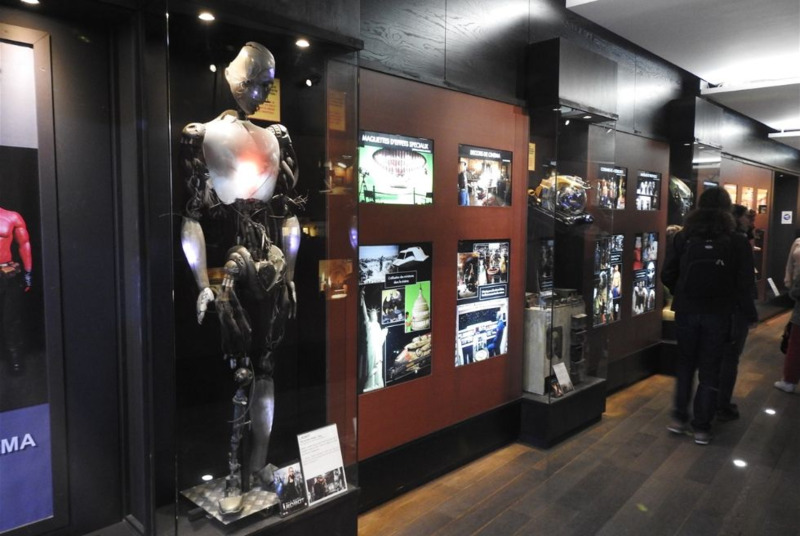 Musée Miniature et Cinéma offers ‘two museums in one’ introducing visitors to the magic of special effects in films, and the poetic world of miniature artists. Admission fee: adults 9€ /seniors 8€/children 6,50€. Rue de la Bombarde on the right descents towards the river while to the left ascents and continues as Montée du Chemin Neuf towards the hill. This is the best way to go up the Fourvière Hill and the roman archeological sites, by car. 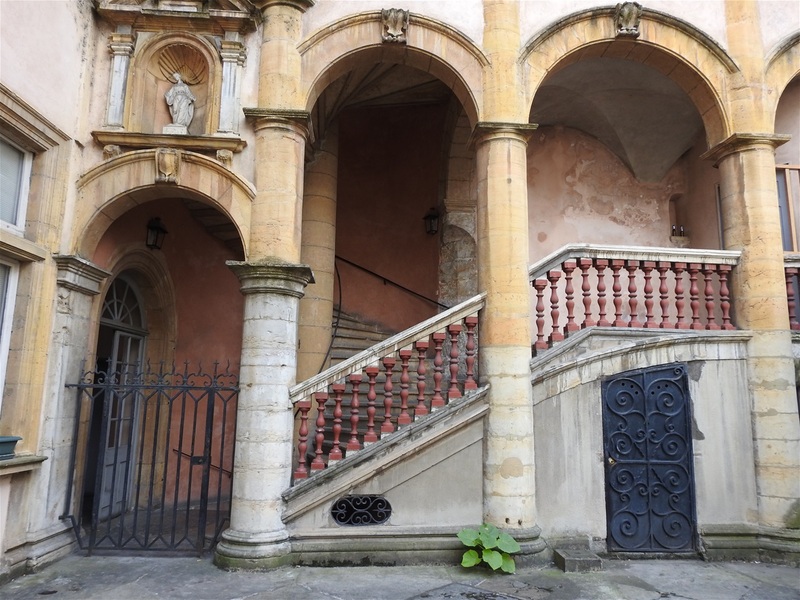 At the very beginning of Rue du Boeuf, hidden between tall buildings there is a narrow and long stairway called Montée des Chazeaux Sendero de Ascenso, which is the best way to climb up to the Fourvière Hill on foot. 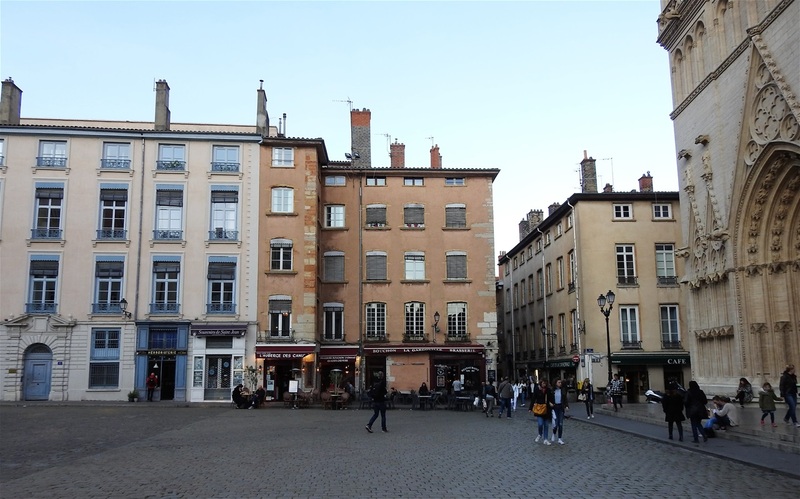 Rue du Boeuf is one of the most beautiful streets in Lyon Vieux, quiet and very atmospheric and has two small shaded squares, at one of which stands the City Hall of 5th arrondissement. Have your drink or meal here if you need to escape the crowds of Rue Saint Jean. On number 27 (some meters after the long stairs) there is a wooden door. Open it and get ready to cross the longest traboule of Vieux Lyon, La Longue Traboule. The other end of the traboule is on number 54 of Rue Saint Jean. As its name indicates, Long Traboule is the longest traboule of Old Lyon. It passes through four separate buildings and has several small successive courtyards. La Longue Traboule. One entrance is located at No 27 of Rue du Boeuf (top left picture) and the other at No 54 of Saint-Jean (3rd row left picture). Palais de Justice de Lyon seen from Passerelle du Palais-de-Justice. Being back in Rue Saint Jean, walk some meters and turn right at Rue du Palais de Justice. 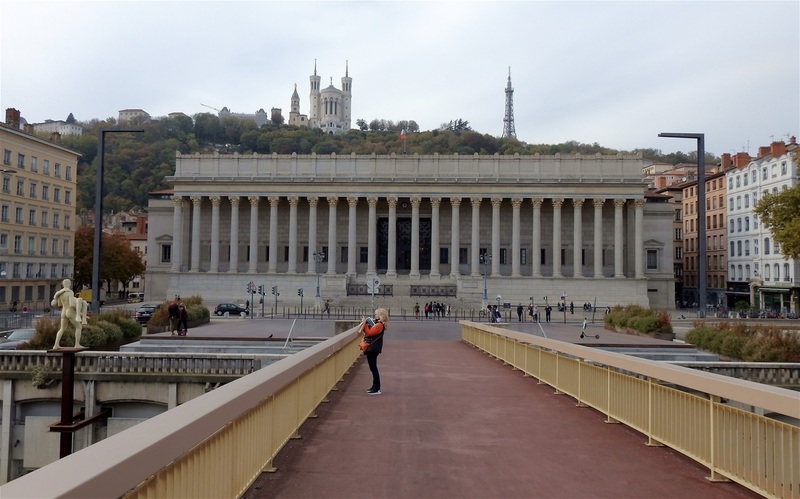 The huge building you are walking by and has its façade on Quai Romain Rolland is the Palais de Justice Historique de Lyon. Its construction began in 1835 and ended in 1845, under the direction of architect Louis-Pierre Baltard. The Palais de Justice was built in the same location as the previous courthouses from the 15th century and it is one of the finest neo-classical buildings in France. It is often called the 'Palace of the twenty-four columns'. In front of the Palais de Justice, Passerelle du Palais-de-Justice connects Vieux Lyon with Presque’ Île. This bridge, inaugurated in 1983, is a 4m wide and 136m long suspended bridge for pedestrians only. 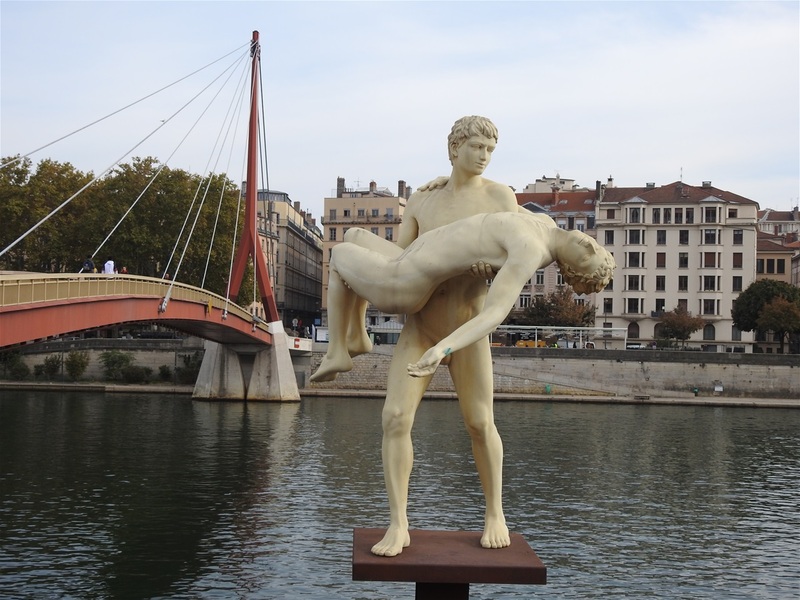 Passerelle du Palais-de-Justice and the sculpture "The weight of oneself" by Michael Elmgreen & Ingar Dragset. Rue de la Bombarde and the Palais de Justice on the right. Some famous trials took place in this building. Among them are: a) August 1884: Italian anarchist Sante Geronimo Caserio, murderer of Sadi Carnot, President of the Republic, was sentenced to death; b) January 1945: Charles Maurras was sentenced to life imprisonment and national degradation; and c) July 1987: Klaus Barbie was sentenced to life imprisonment for crimes against humanity during the Second World War. Back at Rue Saint-Jean. 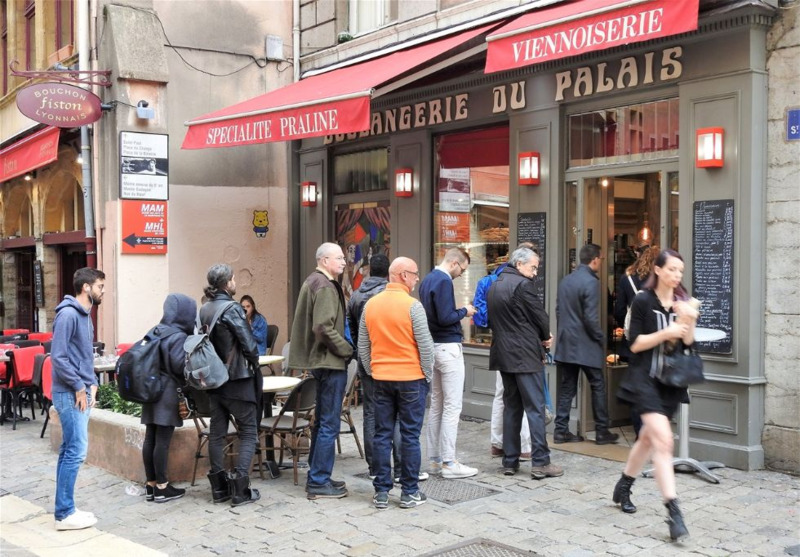 Do not miss to visit Boulangerie Du Palais (at the corner with Rue du Palais de Justice) for a freshly made sandwich, a crunchy piece of pizza, or a "brioche aux pralines" or "tarte aux pralines". The only drawback is the long queues at peak hours... but, believe me it worth the waiting. Boulangerie Du Palais in Rue Saint-Jean. “Lyon, capitale des gones” T-shirt from "Tribu des Gones" shop. Further up the street, the small Place de la Baleine is full of restaurants of every taste. 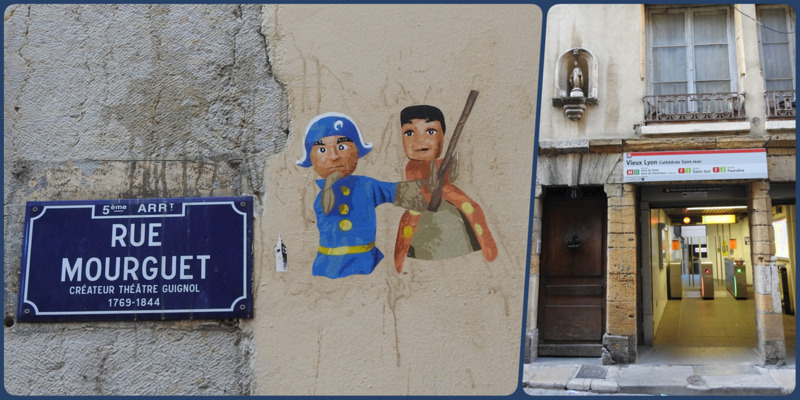 But what you should not miss is the souvenir shop "Tribu des Gones" located on Rue Saint-Jean, at the beginning of the square. 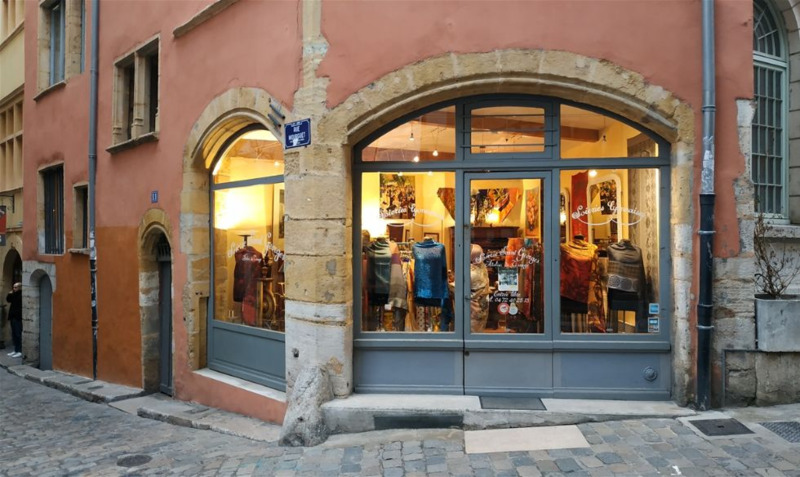 In the shop you will find beautiful T-shirts sold only here and other Lyonnais souvenirs. The first day we visited to buy a T-shirt we were served by a very charming and smiling lady. 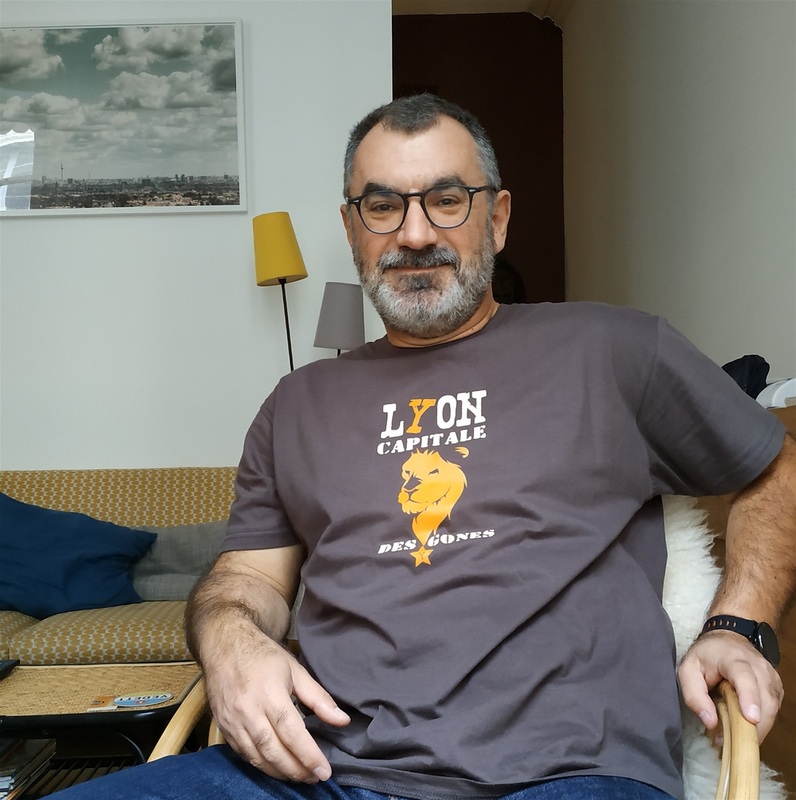 Next day, we were not very happy to be served by a sullen, glum young man…but, never mind, I am so happy with my “Lyon, capitale des gones” T-shirt. Further up north, there is another charming little square full of restaurants, Place du Gouvernement. Weather permitting, have your coffee under the big shady tree. “Le banana's” crêperie serves tasty crepes in a “rustic” room with big windows for those of us who love to watch people pass-by. At the northern east corner of the square, between a silk shop and a bouchon, there is a metal gate leading to another beautiful courtyard/traboule. The beautiful courtyard/traboule at Place du Gouvernement. Outside Le Petit Musée de Guignol. Opposite the creperie stands Le Petit Musée de Guignol. Open since 1995, this little museum welcomes all year-round tourists and locals who wants to learn more about Guignol, city’s hero. 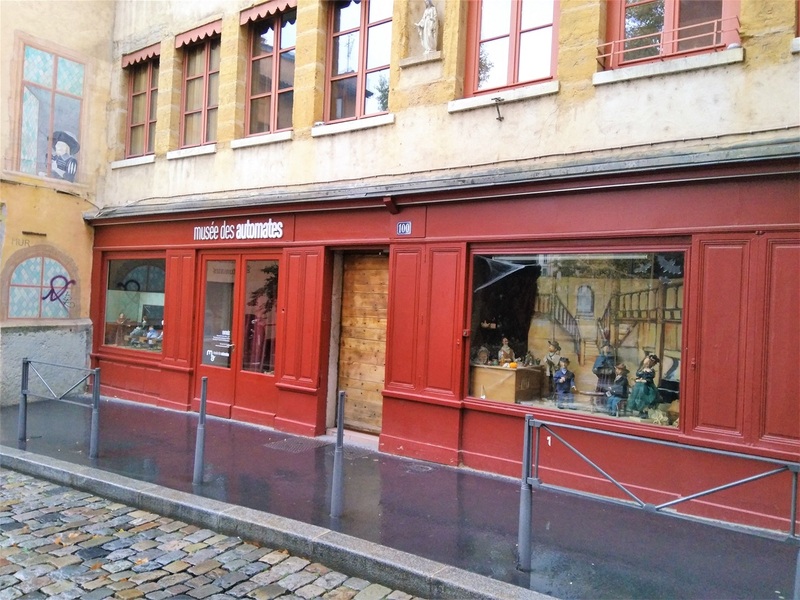 The entrance is through the souvenir shop (6, rue Saint Jean) and its automata, dolls etc., are spread on 2 floors. Here finishes your walk into the charming Saint-Jean quarter. A walk through Saint-Paul quarter. The entrance of "Les musées Gadagne". 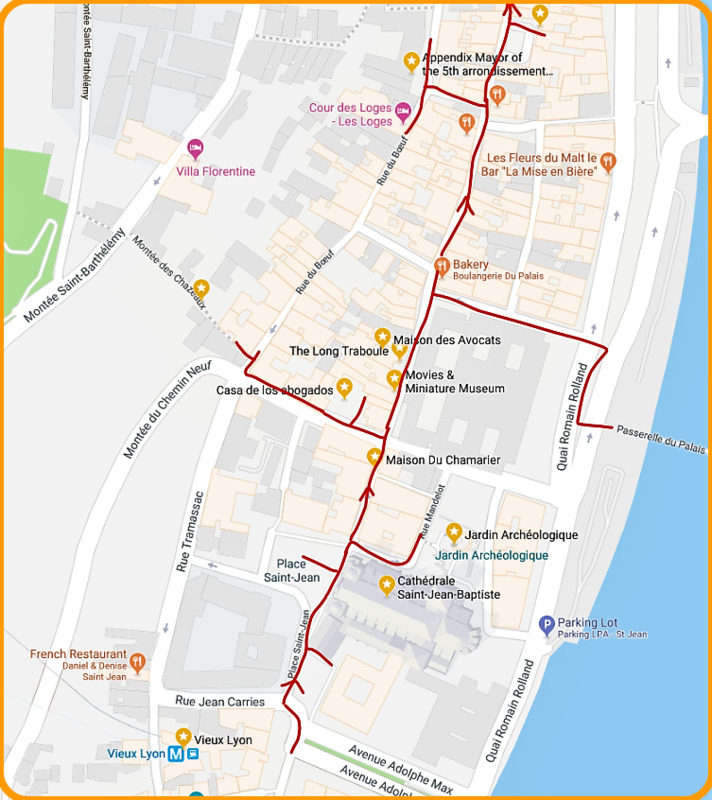 We start our walk in Saint Paul at Place du Petit Collège (which is actually the continuation of Rue du Boeuf to the north), where the most important museum of the old city is located. 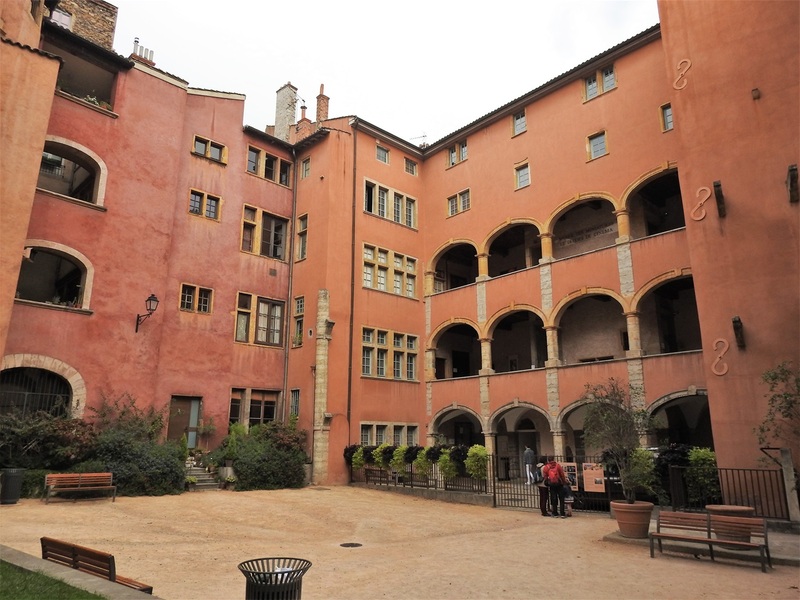 In a 16th-century building with beautiful gardens, Les musées Gadagne are actually two museums in one: MHL-Le Musée D' histoire De Lyon (Lyon's history museum) and MAM-Musée des Arts de la Marionette (International Puppet Museum). Nestled against Fourvière Hill, Gadagne forms a vast, complex, architectural structure: it comprises three five-storeys buildings interlinked around two internal courtyards. The Gadagne site is the city’s biggest Renaissance structure. Entering via the Place du Petit Collège, you take the arched gallery to reach reception. 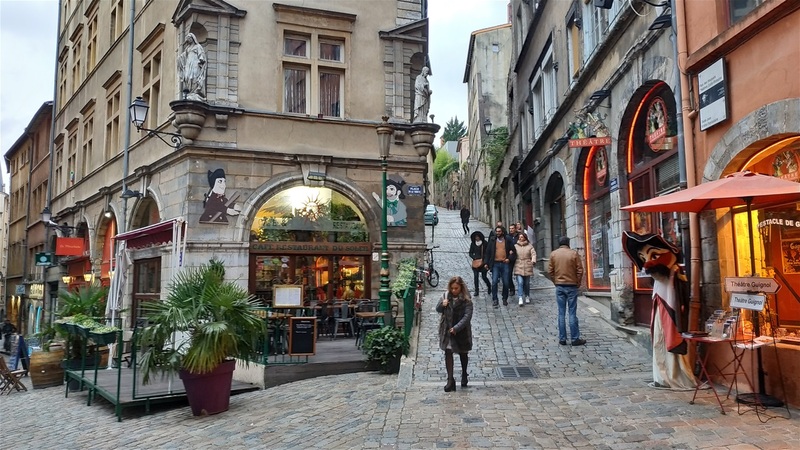 You can then choose where to go from there: the Puppet Museum, the Lyon History Museum, the petit théâtre (small theatre), terraced gardens or the café. The courtyard of Le Musée D' histoire De Lyon. Inside Le Musée D' histoire De Lyon. 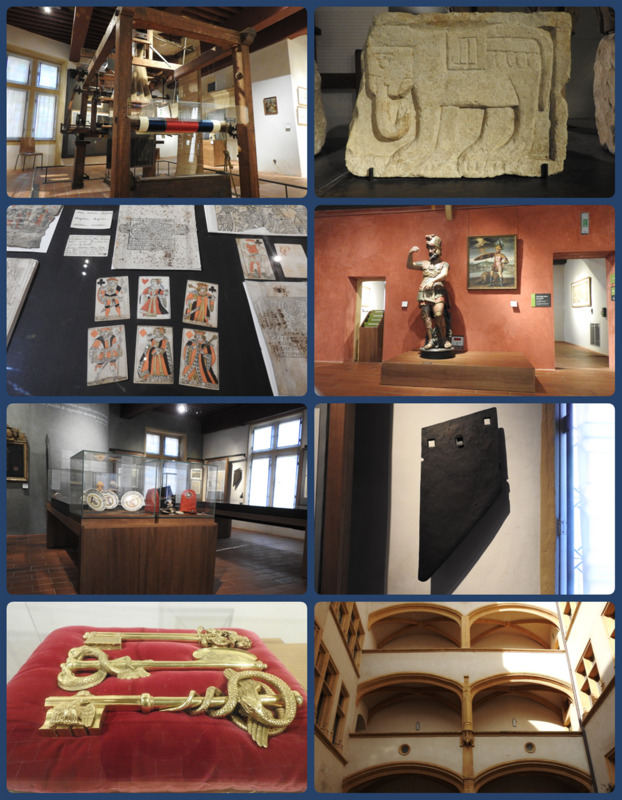 When we visited the only part open to visitors was the Lyon History Museum. The rest of the Gadagne was under renovation and planned to reopen in late 2018. 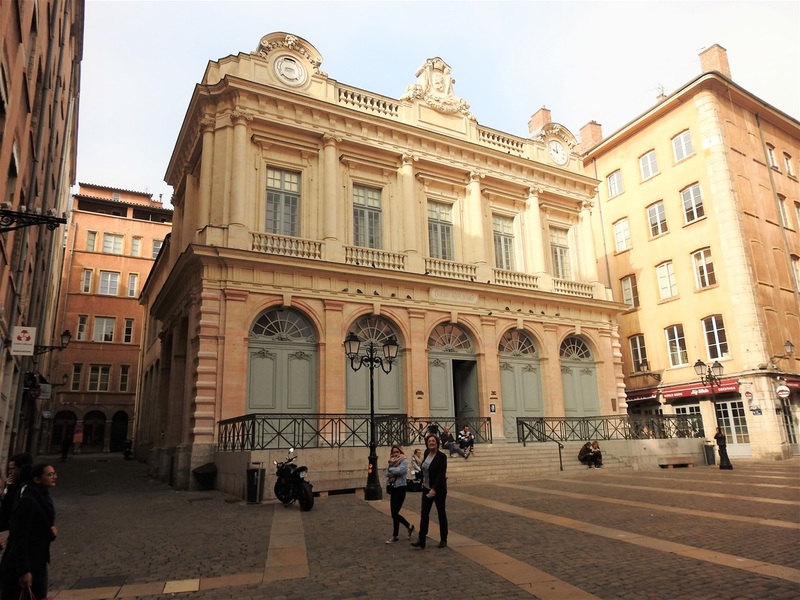 Throughout the 31 permanent exhibition rooms, the Lyon History Museum provides you with keys to improve your understanding of how Lyon became the city of today. The exhibition seeks to highlight how the city developed, era by era: phases of destruction or construction, extension or regression as well as social, economic and cultural activities and important events, etc. MHL-Le Musée D' histoire De Lyon is one of the most impressive museums I have visited ever. Continue some meters to the north and turn right on the first street you see, Rue Soufflot. Rue Soufflot leads you to another beautiful square, which is actually the northern end of Rue Saint-Paul. 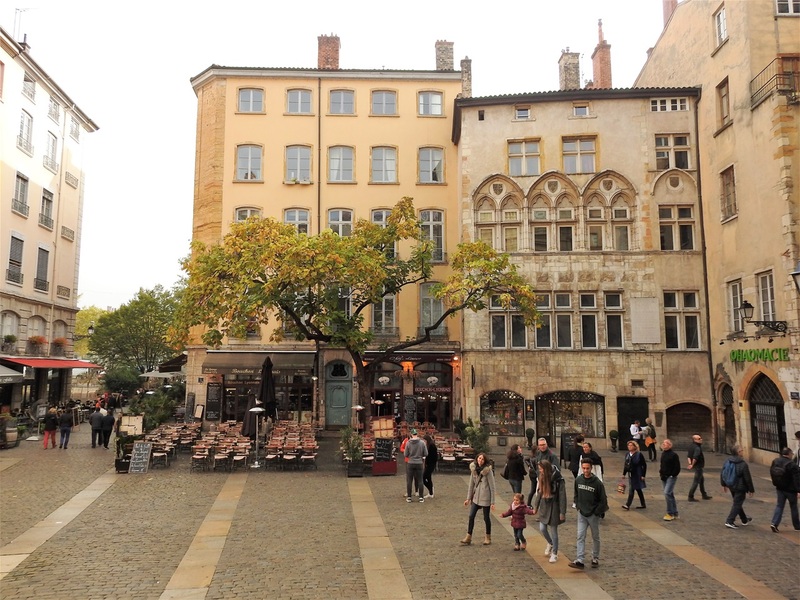 Place du Change took its name from the building that dominates the square: Temple du Change or Loge du Change, formerly used for the stock exchange of Lyon. Temple du Change was originally built after plans by architect Simon Gourdet between 1631 and 1653. The first Loge du Change was a small classical building with four arches in front and two on each side. It soon became insufficient for Lyon's money exchange, so it rebuilt under the direction of Jacques-Germain Soufflot in 1748-1750. The building façade has five arches which are complimented by five neoclassical windows above each of them. Behind the façade rises a large room, as high and wide as the building. It is rectangular with an imperial-styled roof supported on four massive pillars. The building has been assigned to Protestant worship since 1803, hence its designation Temple (Reformed Church). 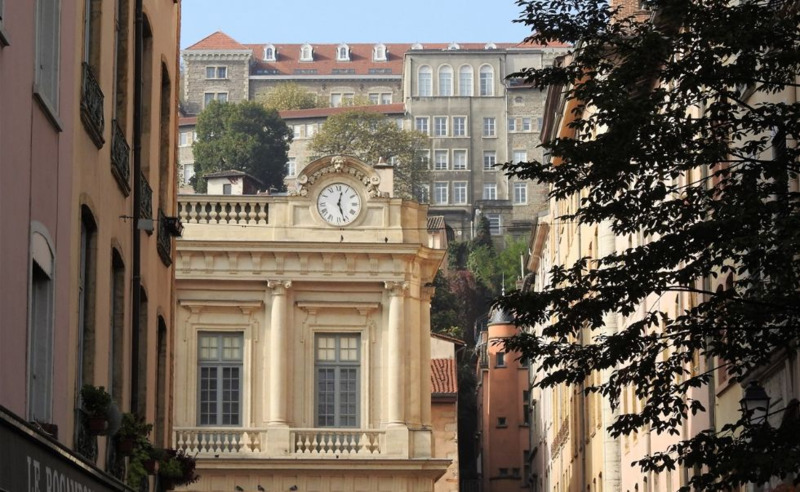 In December 1999, the city of Lyon added two clock mechanisms on the façade. The clock on the right was put at the same position where an original clock was and has a traditional dial, which indicates hours and minutes. In contrast, the dial on the left is more surprising because it marks days, months and years. One of the clocks of the façade of Loge du Change. Place du Change. La Maison Thomassin on the right. Opposite Loge du Change stands La Maison Thomassin, one of the oldest houses in Lyon. It was built in 1298 by the Fuers family. From that era, remains only a painted ceiling in a room of the first floor room, discovered in 1968. In 1493, the facade of the building was completely rebuilt in the purest Gothic style by Claude Thomassin, the new owner. The house was restored thoroughly in the twentieth century. 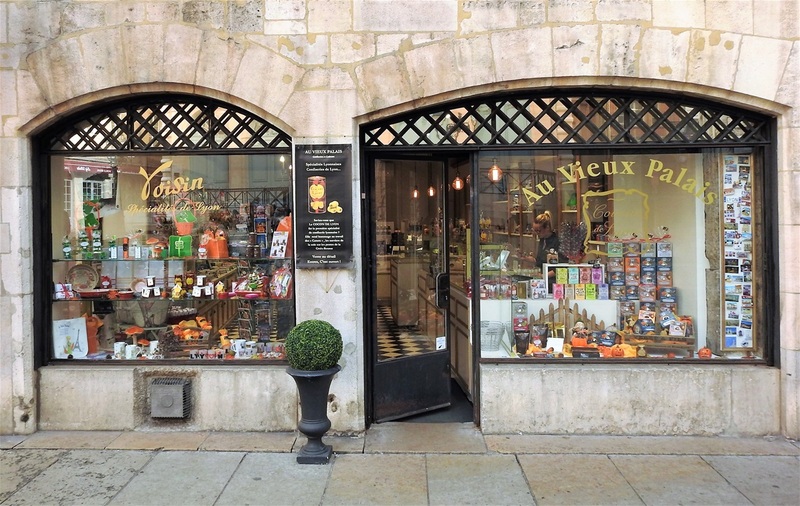 Confiserie Au Vieux Palais is located on the ground floor of La Maison Thomassin. Both Fuers and Thomassin families were among the prevailing families of Lyon. The Thomassin family, got its wealth thanks to the fabrics trade, and settled on the Place du Change, the place of several trading fairs. On the ground floor of the house a beautiful confiserie Au Vieux Palais welcomes the visitor with every kind of local specialties. At the north side of Place de Change, cafe-creperie Le Savanah, is the best place in town for watching people. Weather permitting, get a table on the square and watch tourists passing by while drinking your coffee. 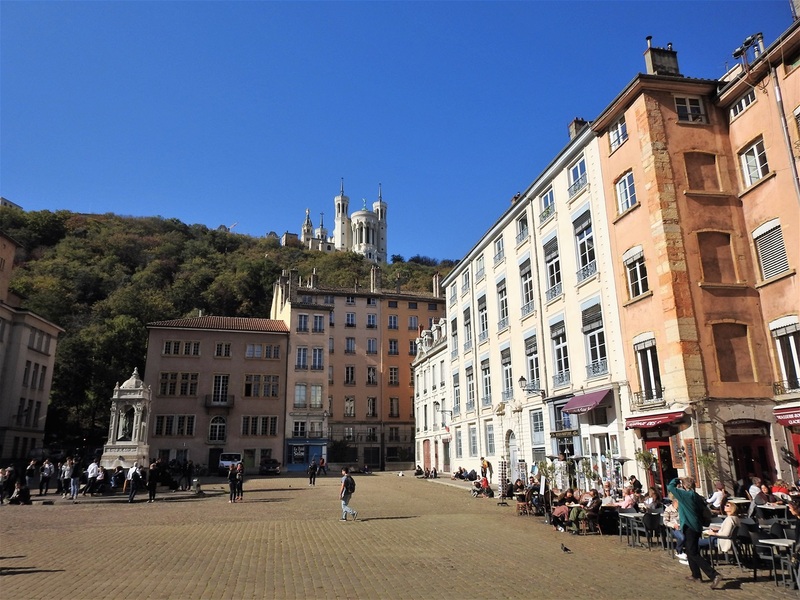 If you want something more traditional, have your coffee at Le Rocambole Café-Terrasse and admire one of Lyon’s big frescos at a big wall at Place Ennemond Fousseret. 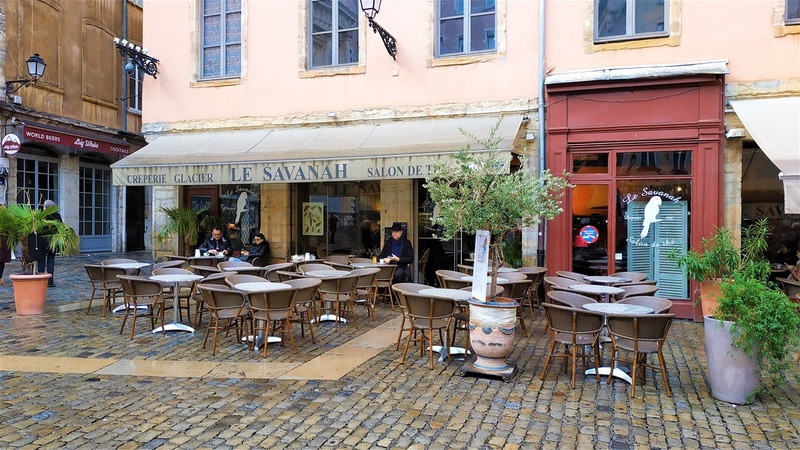 At the north side of Place de Change, cafe-creperie Le Savanah, is the best place to watch people passing by in town. Continue your walk on Quai Romain Rolland and enjoy the views of the river. Here, Every Sunday from 8 am to 1 pm operates Le Marché de la Création. Since 1979 at the right bank of Saone River, in front of the Palais de Bondy, artists display their creations. 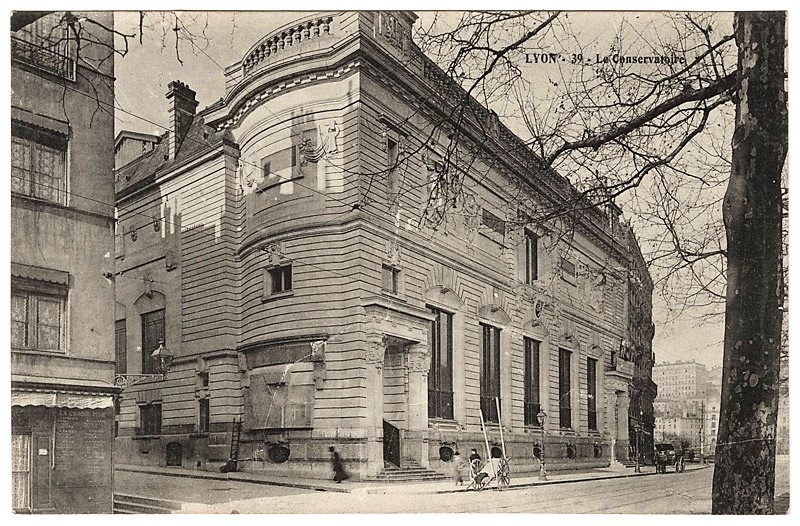 The purpose of the construction of Palais de Bondy was to accommodate the Conservatoire (which at the time did not have any place dedicated to its activities) as well as exhibition halls. 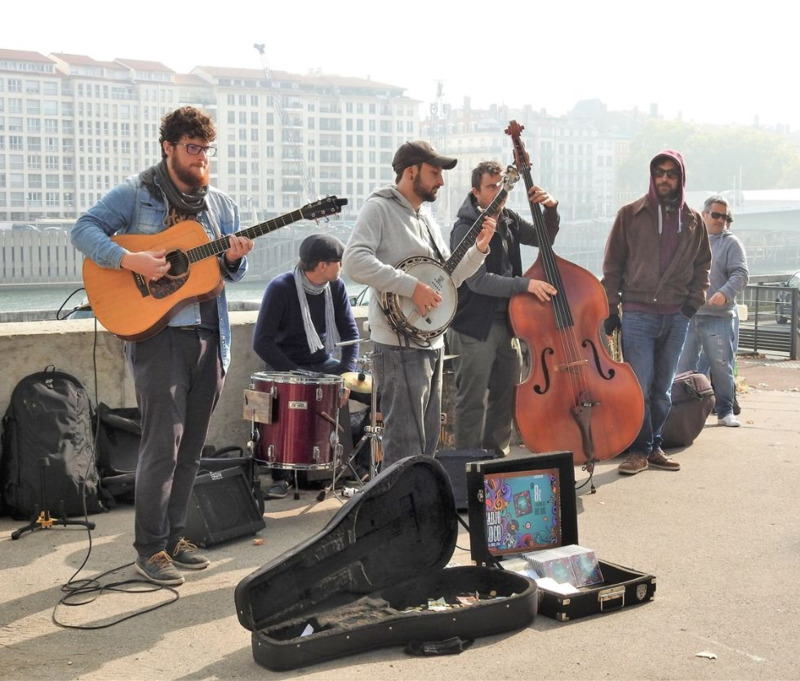 A group of musicians at the right bank of Saone River, in front of the Palais de Bondy. It was built between 1902 and 1904. The architect Eugène Huguet was in charge of the works. This project includes an imposing building occupying the area from rue de l'Angile to the Bondy Quay. Two entrances lead to a vast vestibule with a ceiling decorated by the painter Louis Bouquet. From the vestibule there is access to the different levels of the concert hall, called Salle Molière. On the first floor, there are two main exhibition halls: the Grand Salon and the smaller Salon à Rotondes. 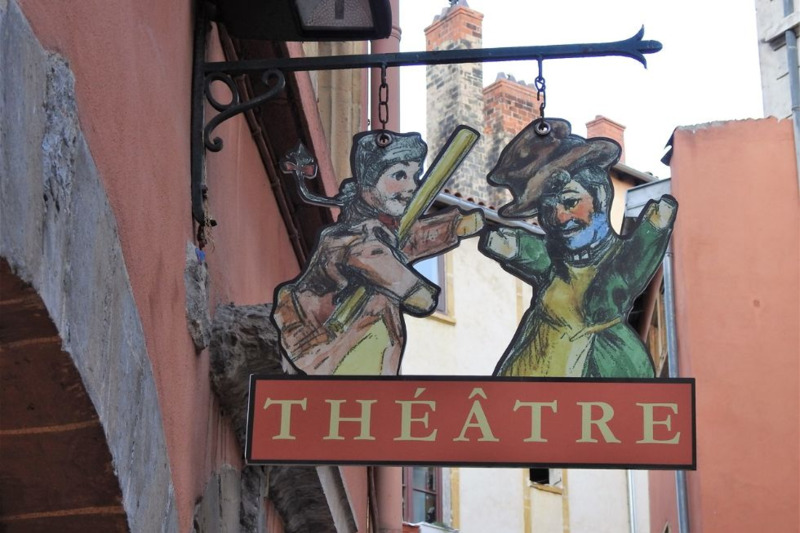 The ground floor of the building, at number 2 of Rue Louis Carrand, hosts another venue for Lyon's traditional, satirical puppet show: Théâtre le Guignol de Lyon. Continue on Rue Louis Carrand, pass in front of the beautiful white building of Collège Hôtel and head north to Gare de Saint Paul. The station opened in 1897 and today it is a terminus for local trains serving the western suburbs of the city. Opposite the train station stands the most prominent building of the quarter, Église Saint-Paul. Saint-Paul train station seen from Rue Octavio May. The lantern of the top of the octagonal tower built in 1835. The first church here built around 549, damaged in 732 and restored in the early 9th century. In the 10th century, it became a necropolis with three cemeteries. Archbishop Hugh of Die requested its reconstruction, which was accomplished during the 11th and 12th centuries (the bell tower built in 1440). 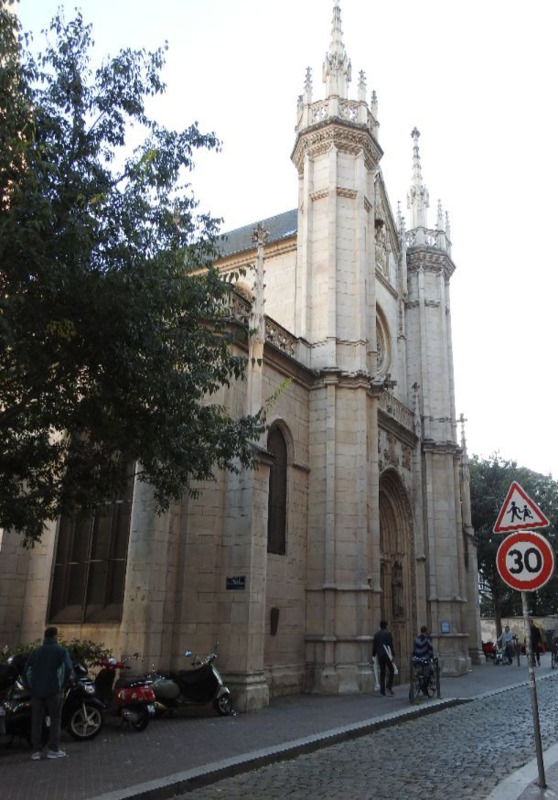 The church was damaged during the siege of the city by the Baron of Adrets, then during the revolution in 1793, it was transformed into a saltpeter (Potassium nitrate) store and finally it became a parish church in 1801. Many changes were made to the church during the 19th century, along with numerous additions: the lantern of the top of the octagonal tower in 1835, the Gothic portal in 1877, paintings by Paul Borel added to the choir in 1899, the eleven bells of the bell tower, and so forth. The church, like every other parish church in the area is open only for a few hours daily (during the mass hours), so it is almost impossible to visit the interior. 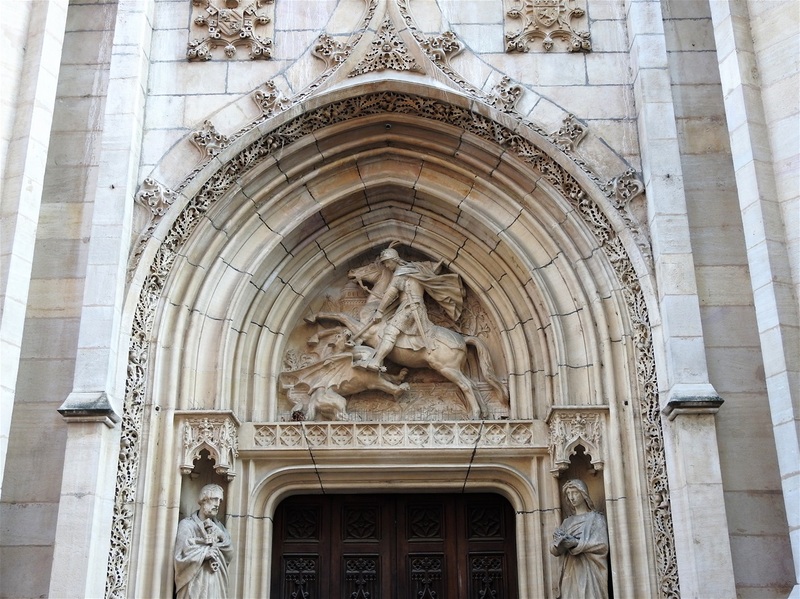 The Gothic portal of Église Saint Paul. 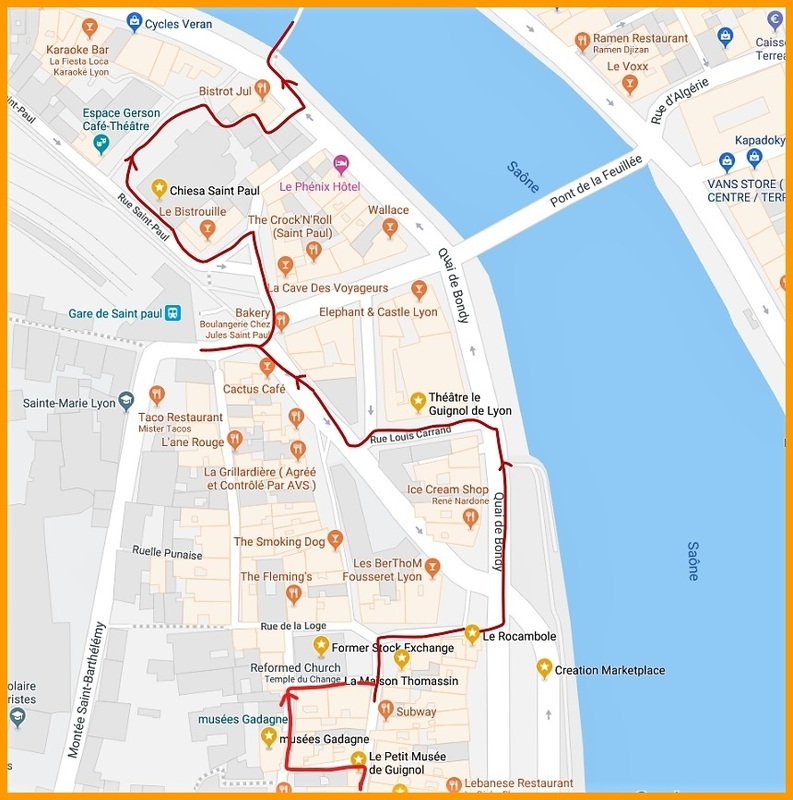 Regardless of visiting the interior of the church, walk around it in a small middle-ages labyrinth and finally end your walk in Vieux Lyon on Passerelle Saint-Vincent over Saone River for a 3600 view of the city. Here finishes your walk in Vieux Lyon. 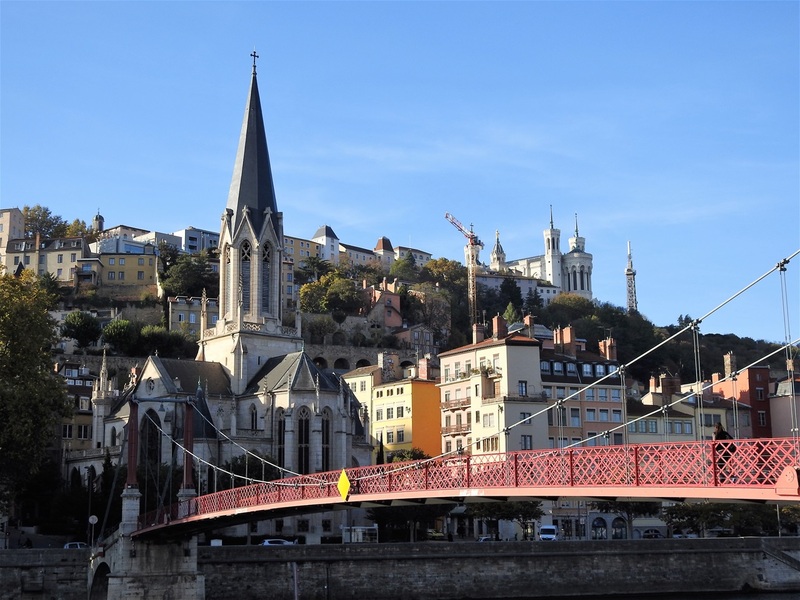 Passerelle Saint-Vincent and Saint-Paul quarter.